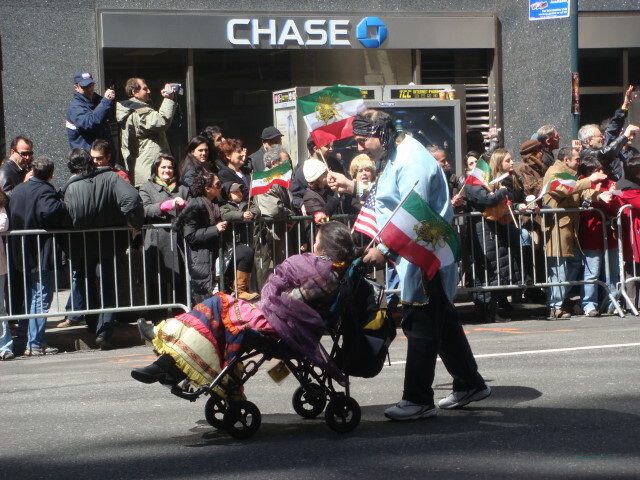 So, where were we with the Persian Day Parade? 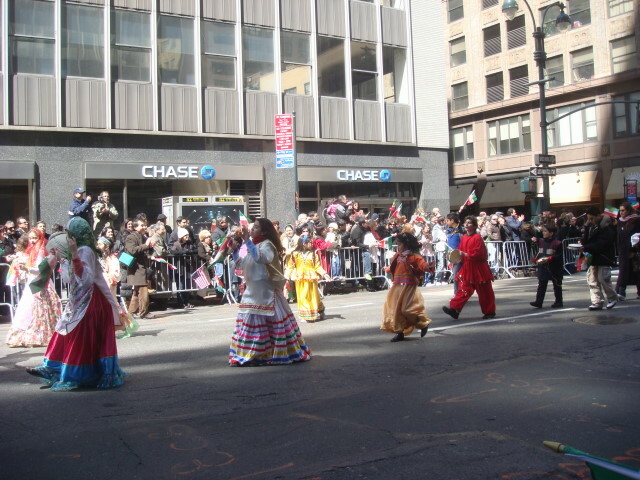 Oh yeah, more floats and dancing girls. I actually don’t mean to be too flippant with the “dancing girls” lines. 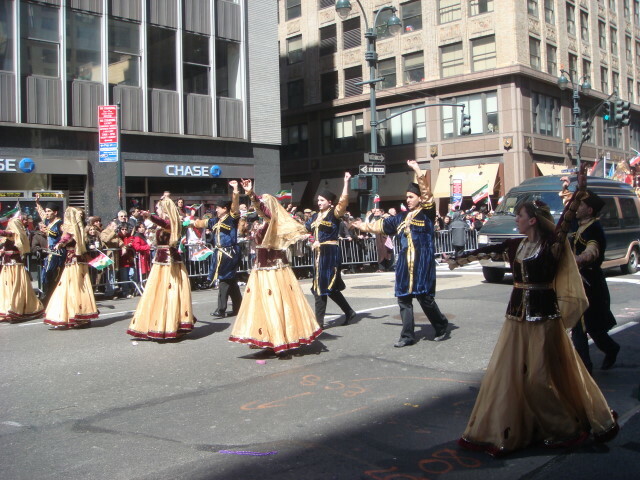 In fact, the ages of the dancers went from very young to women of a certain age. 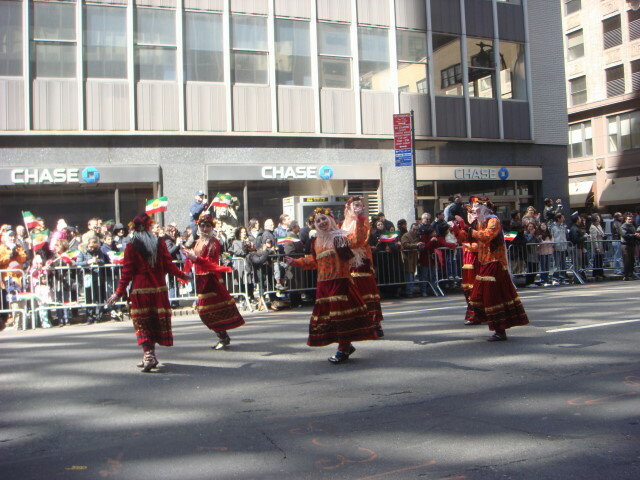 The dancers, who were mostly female, were always modestly dressed and their dancing was really much more celebratory than anything else. But the phrase “dancing girls” is stuck in my mind and the reader will have to bear with me. This next group was perhaps the best of the bunch and perhaps the largest one, too. I just couldn’t pick a single picture to show how well they did. As they pulled up just past me, they went into one of their routines. 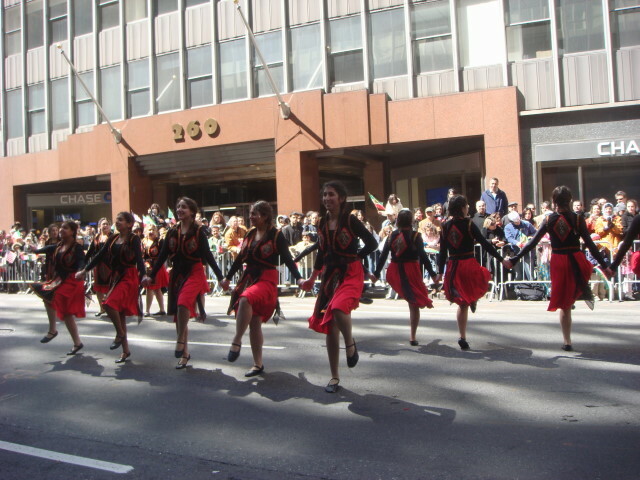 They were wonderful to watch and couldn’t have been more enthused in the dance. 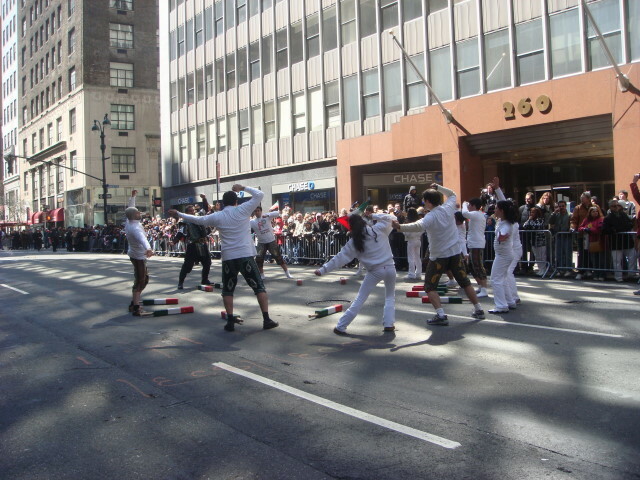 And, despite what it looks like, they weren’t doing a Rockette’s routine. I don’t know what it was, but it wasn’t Radio City Music Hall stuff. Just girls dancing…dancing girls. 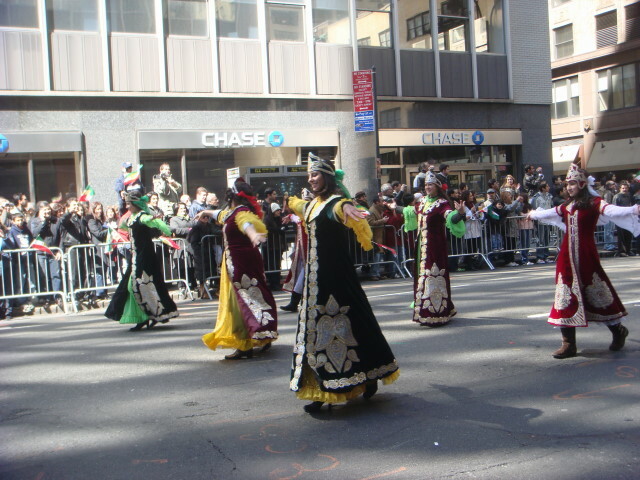 Followed by more dancing girls. 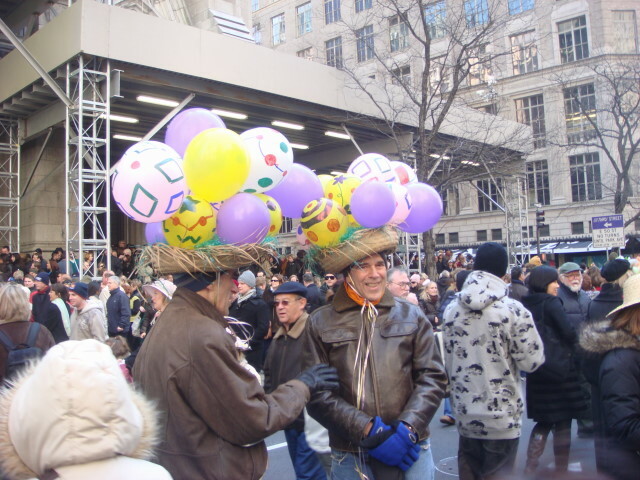 These were perhaps my best pictures of the day, at least in my eyes. 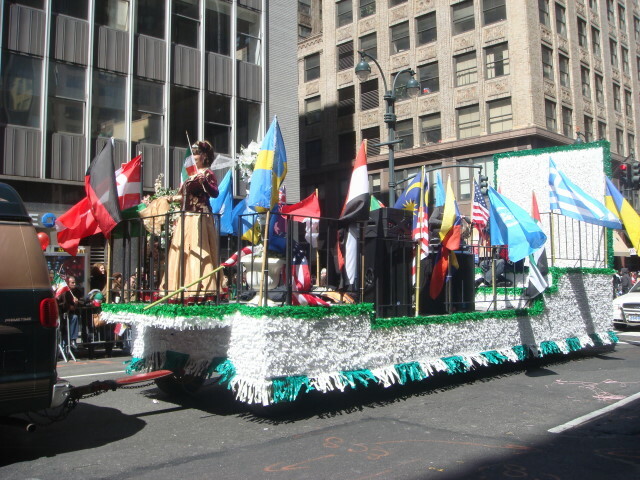 And they were followed by….No, not a float. 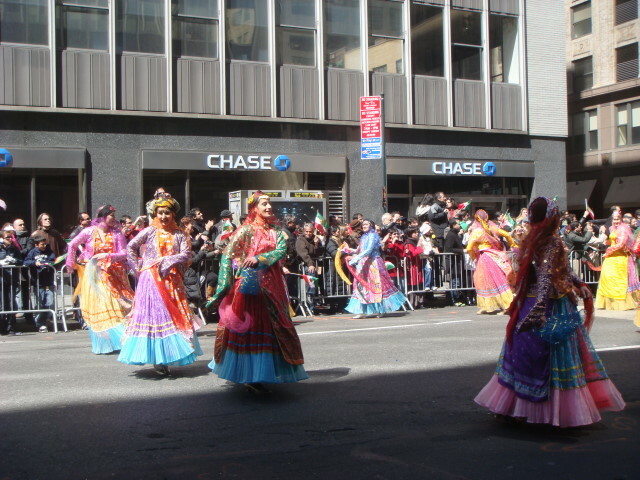 Nope, these dancing girls were followed by more dancing girls! Including one in a wheelchair. You can’t keep a good dancing girl down. 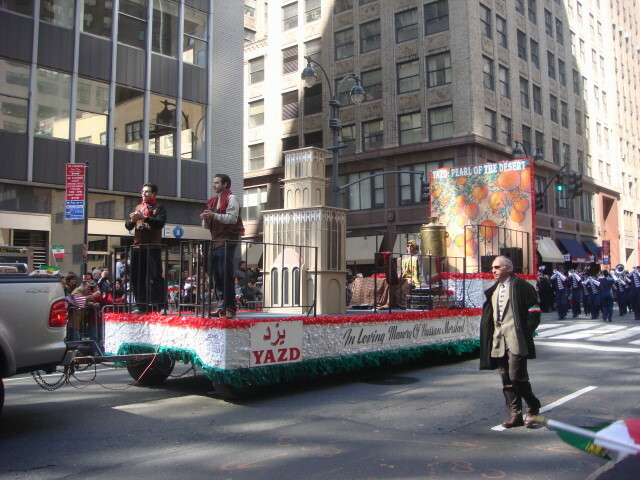 Now, they were followed by a float. 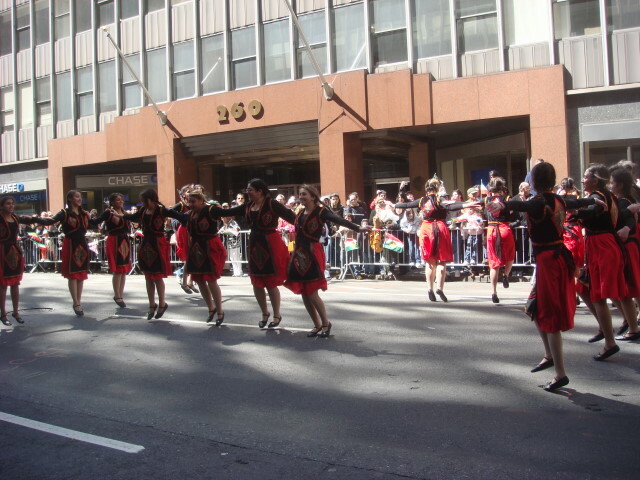 Which was followed by…dancing girls! 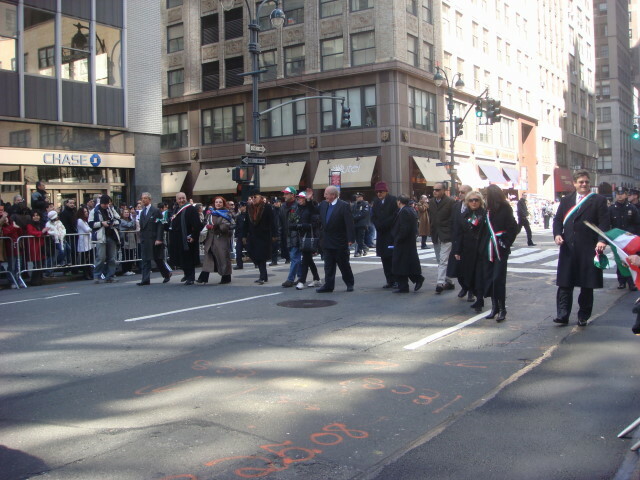 Next was a bit of a surprise: dignitaries. 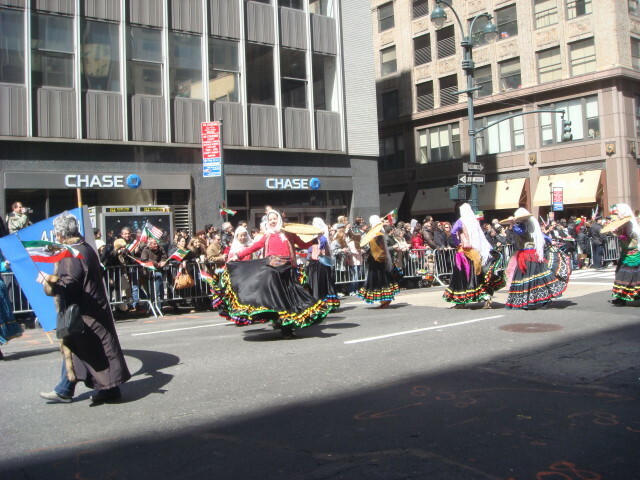 Who was followed by…dancing girls! 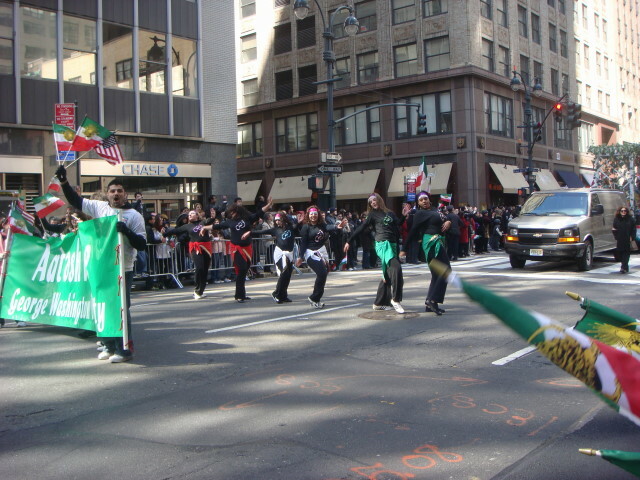 Followed by another group. This one had male and females. 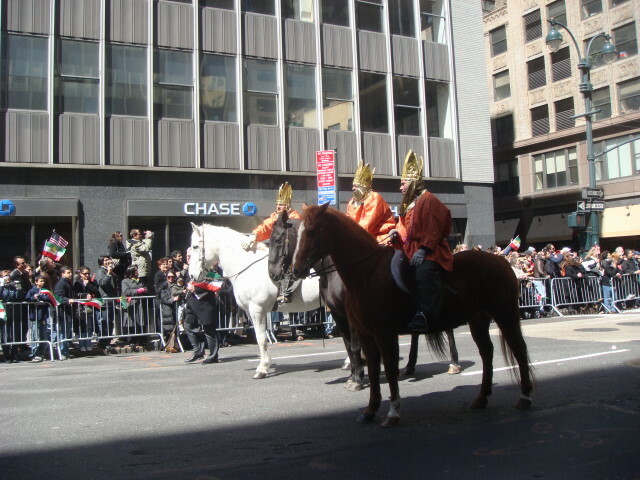 And Zoroastrians on horses. I don’t know the symbolism. 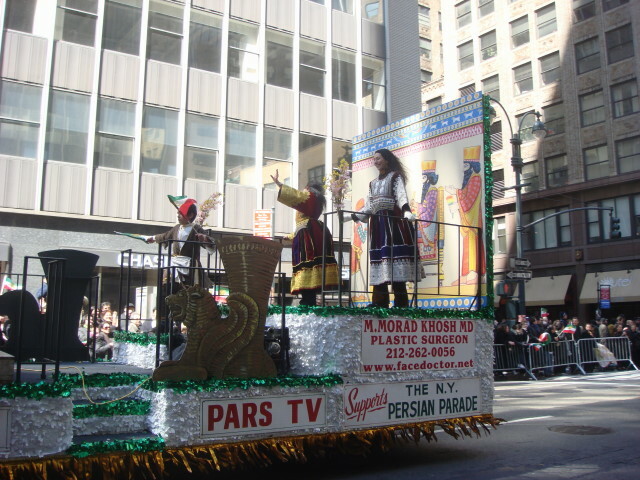 Which was followed by floats dedicated to Cyrus the Great. 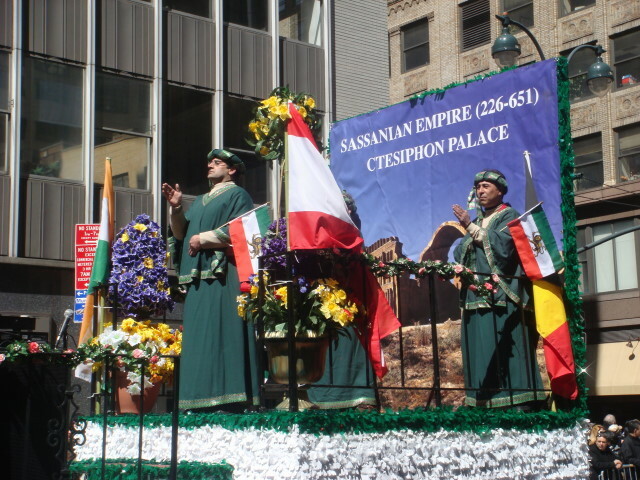 and to the Sassinian Empire (226-651) and the Ctesiphon Palace. 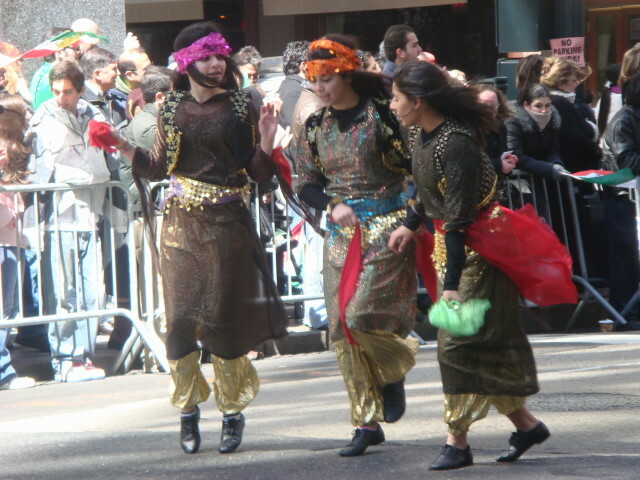 Followed by…more dancing girls (this is the Afsanch Ballet, a San Francisco group, doing a dance from Gilan). 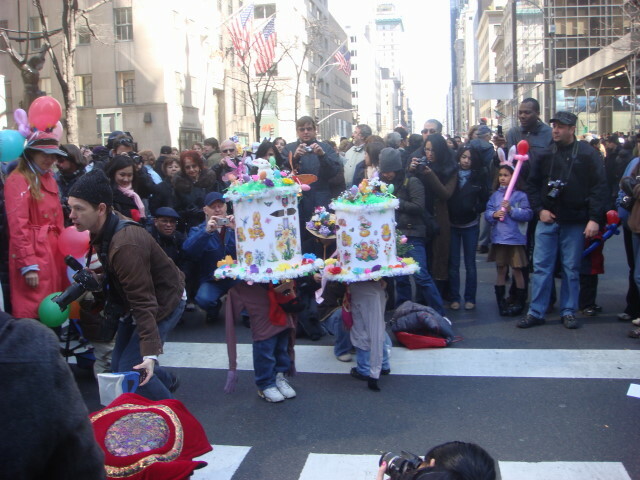 Followed by a float dedicated to children. 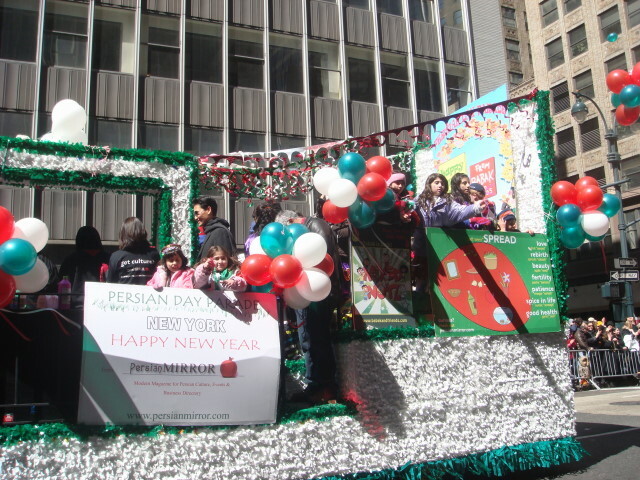 This was a very popular float as the kids had bead necklaces they were throwing out to the crowd. 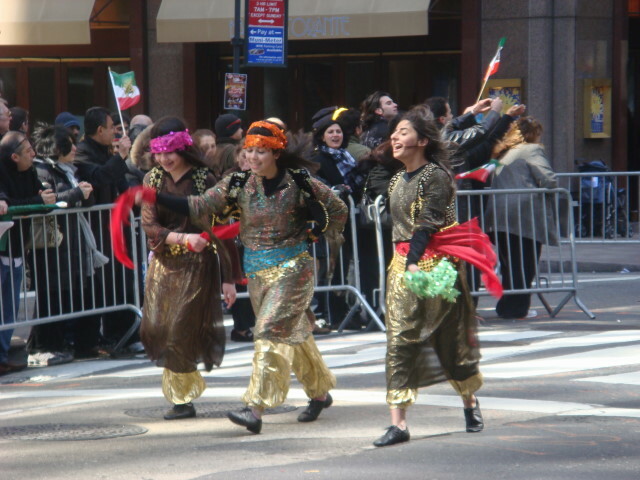 Followed by…wait for it….dancing girls! 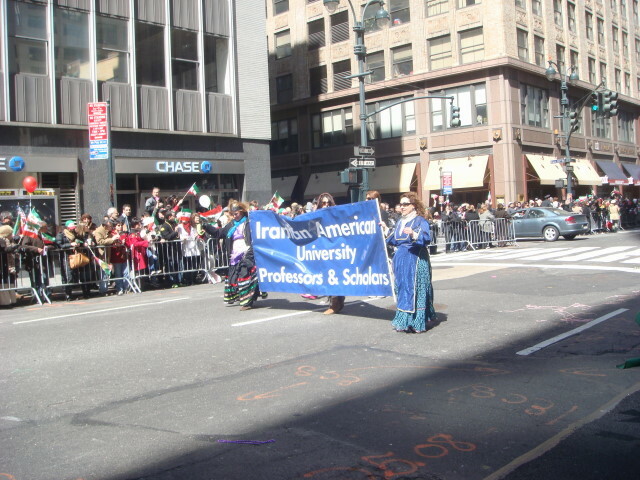 Which was followed by….dancing scholars! They were holding the sign, but that didn’t stop them from dancing! 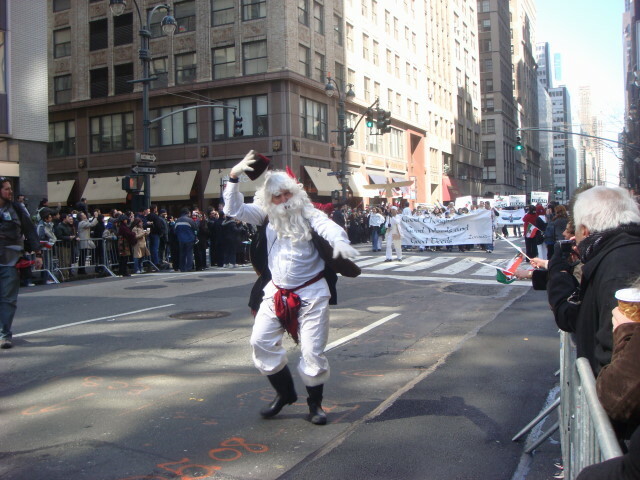 Which was followed by…dancing Rumis! Rumi was a mystical Persian poet. 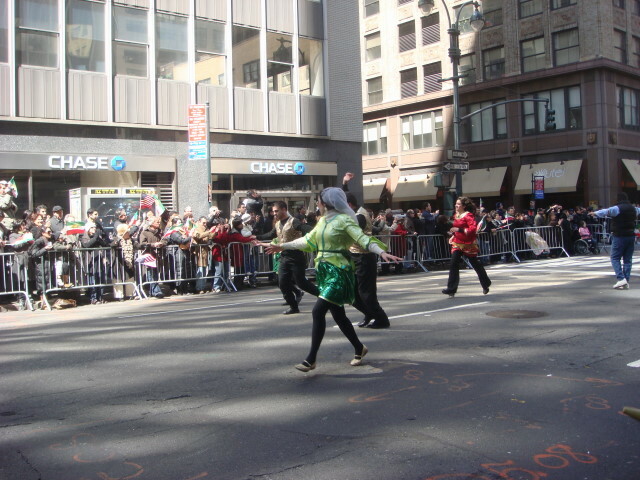 Followed by more dancers (some men this time). 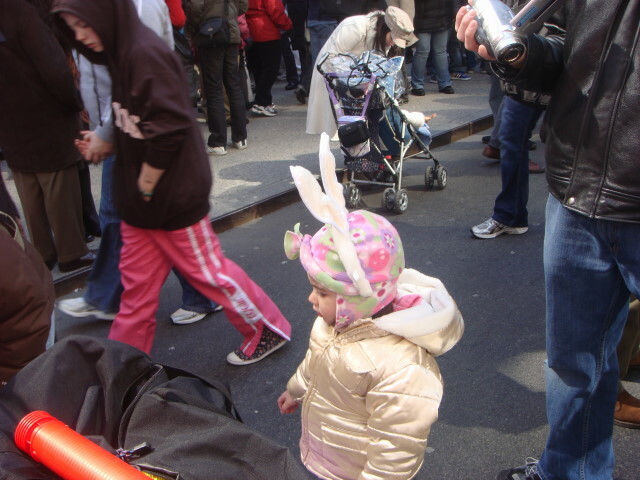 Which was followed by…the end of the parade. 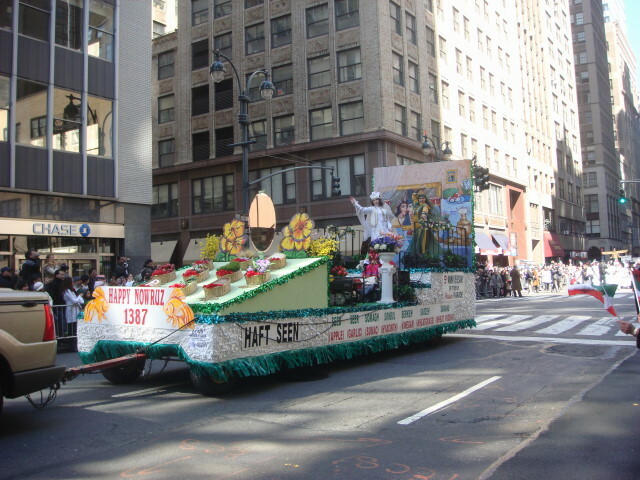 A final float. 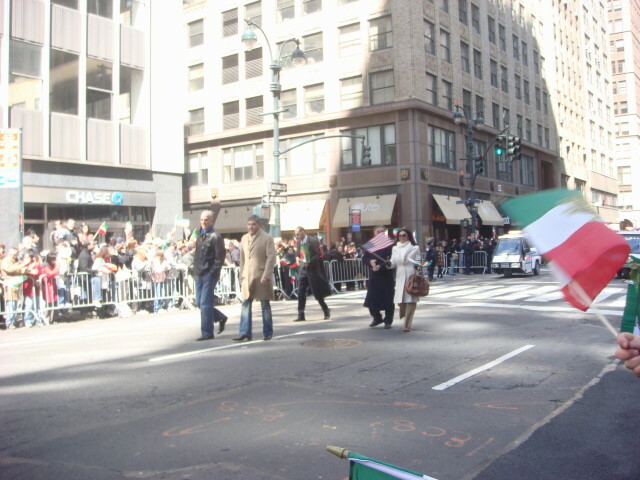 The whole parade lasted about 90 minutes (well, I was at 39th Street and the parade went down to 27th Street so they marched for longer than I watched). 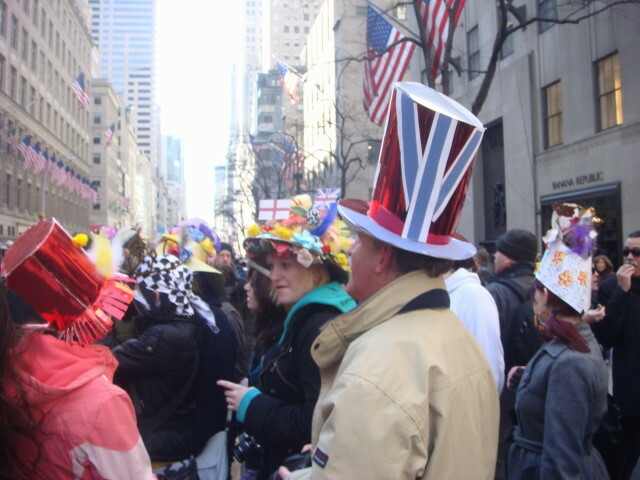 My Finnish friends took off after about 75 minutes when the cold got to them, but I was happy to stick it out. 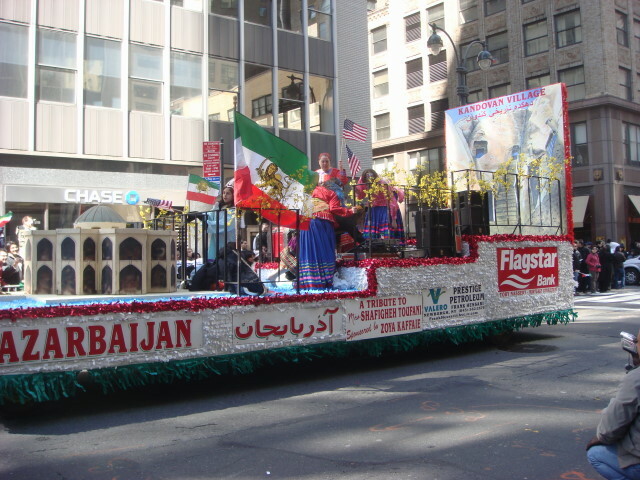 In summary, the Persian Day Parade is a favorite of mine. 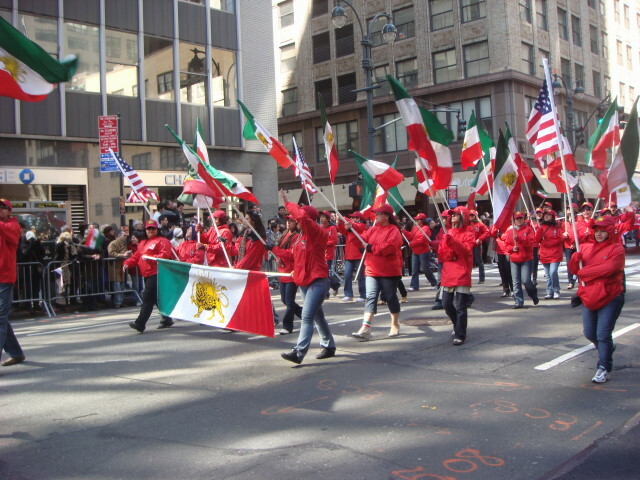 As I mentioned to the reporter a year ago, it shows the incredible breadth of the culture from that part of the country and reminds us that Persian culture and the Iranian people are so much more than we see in the current news. 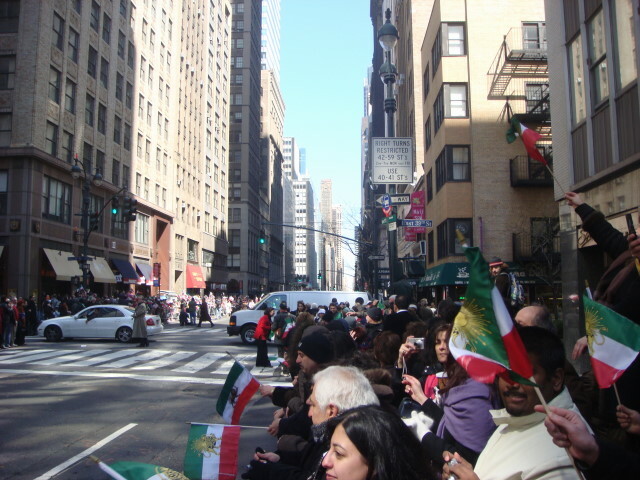 So, after Church I did a little searching and discovered that it was the annual (actually, the 5th Annual) Persian Day Parade. 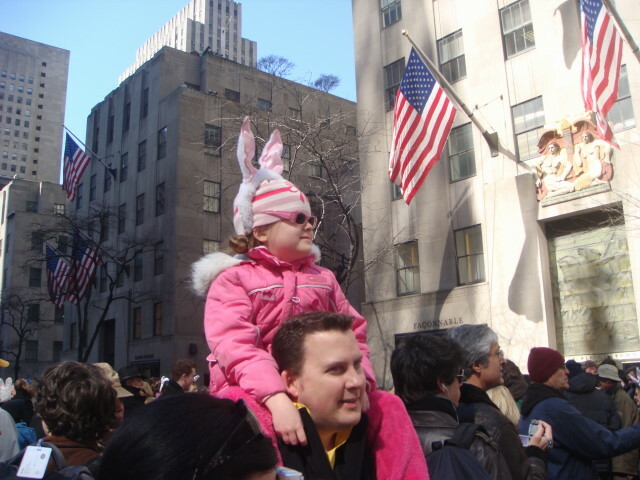 No joke: it’s one of my favorite parades in New York City. Certainly in my top 5. I couldn’t miss it. 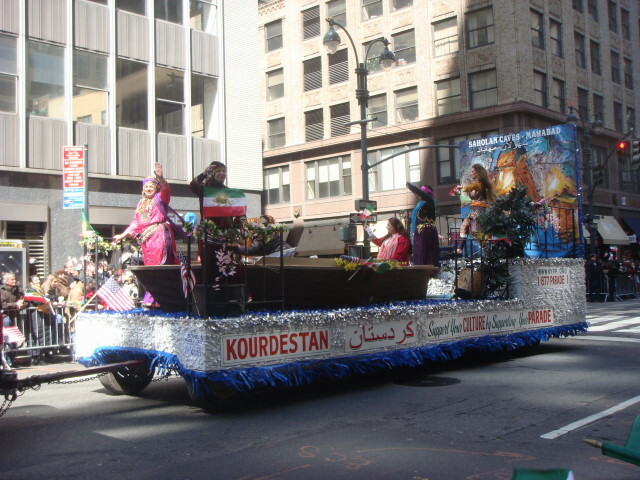 Last year was the first time I ever saw it and I actually had a “celebrity moment” when I was interviewed by a Persian TV crew who couldn’t figure out why this really, really white guy was watching the parade. 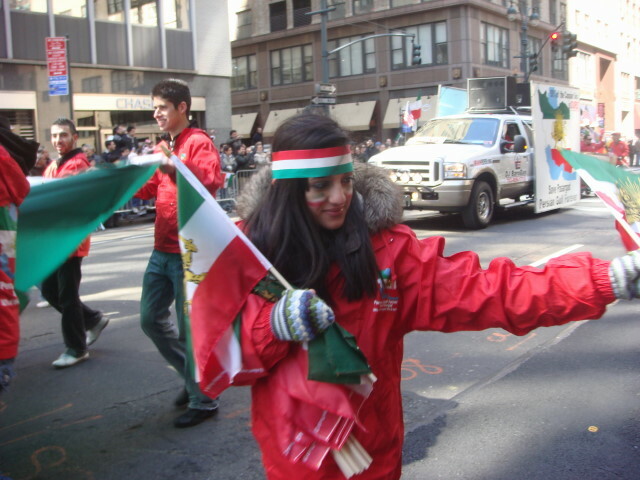 The reporter asked me if I knew what was going on and, smart aleck that I am, I started talking about how it was the Persian New Year which is celebrated at Springtime and how the Persian Empire stretches back thousands of years and Cyrus the Great and all that stuff. I mystified that poor woman to no end. 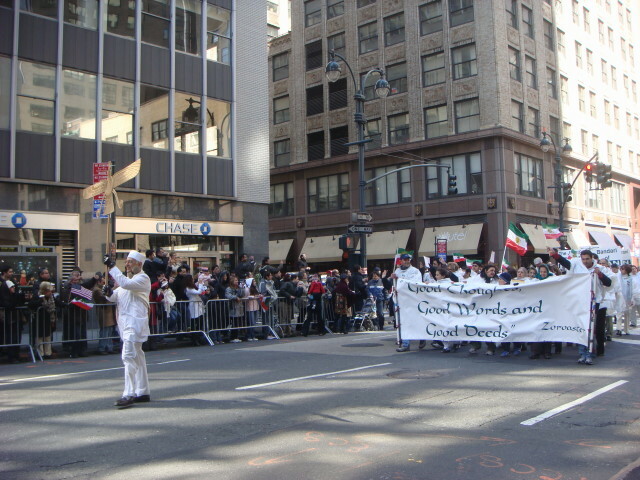 If nothing else, my dicotomy between Persian and Iran (ancient versus modern) was really the point of my response and that this parade was a celebration of the ancient heritage that is one of Iran’s great treasures. 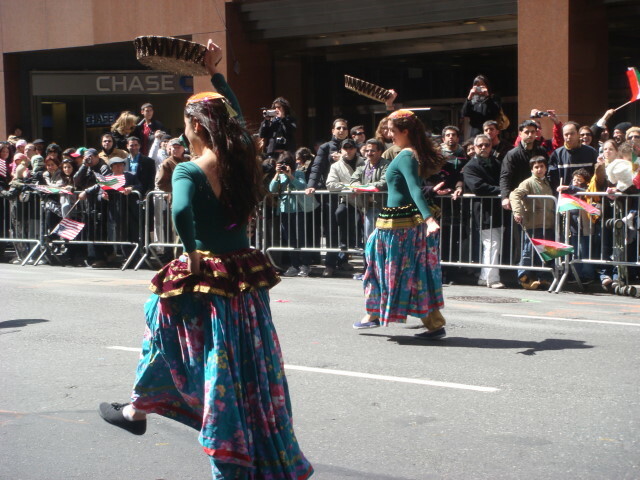 Besides, the Persian Day Parade is filled with dancing girls. 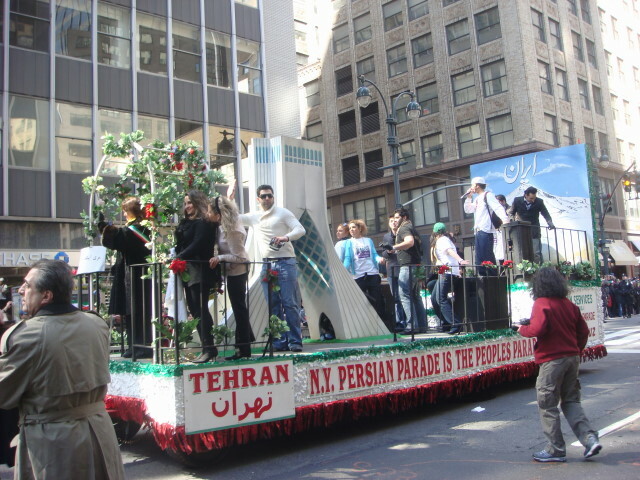 Not what you’d expect from modern Iran. 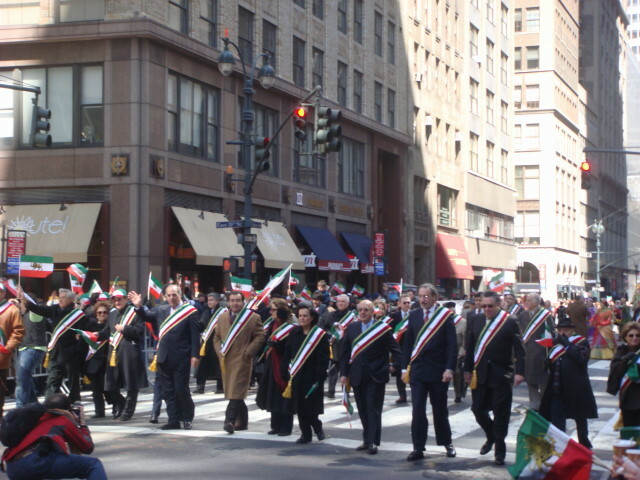 Here’s a picture of the dignitaries from near the beginning of the parade. The next picture is a bit of a mystery to me. 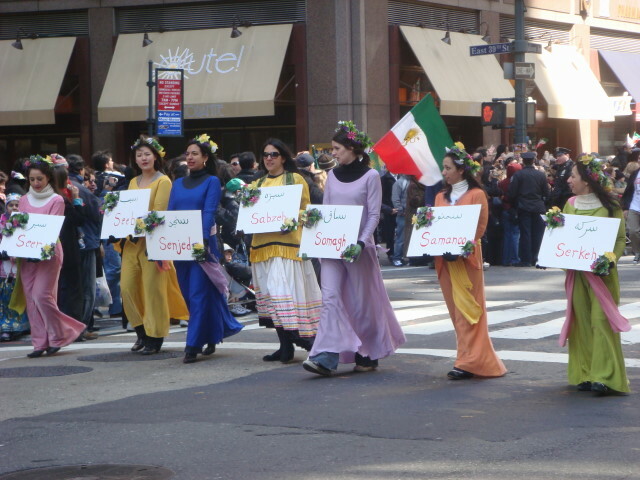 I think the women are carrying signs representing the months or seasons. 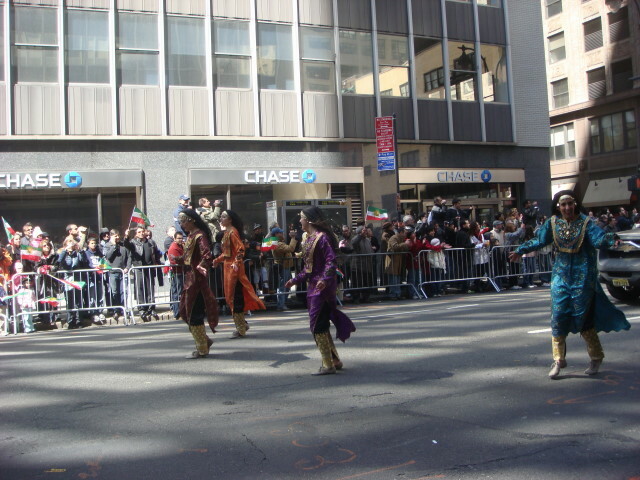 This is one of the few times that you saw Persian women who weren’t dancing. 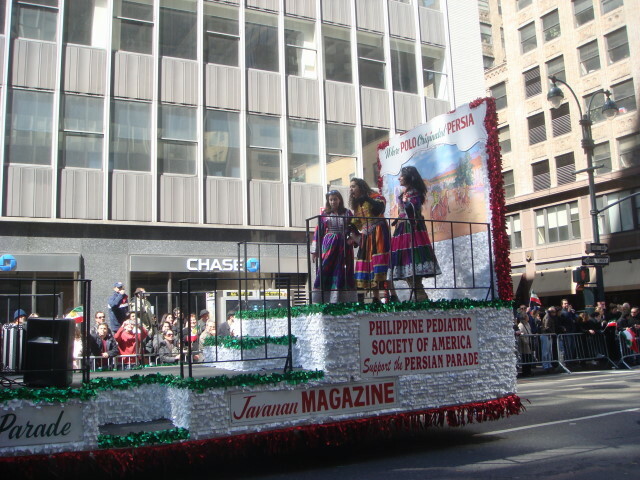 The next float shows one of the usual problems with other cultures: spelling! 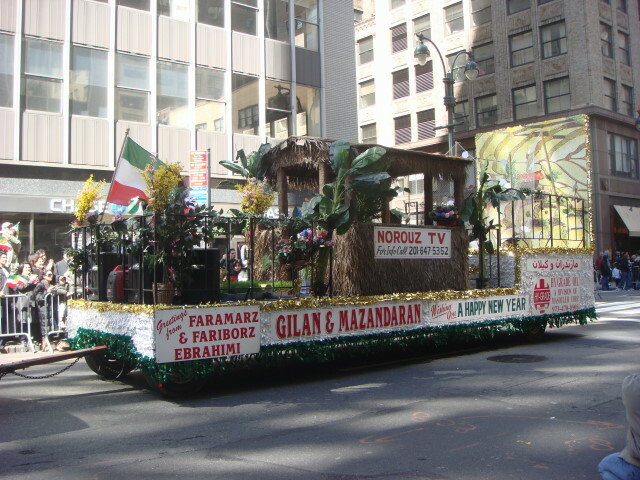 Is it Norooz or Nowruz? I’ll just use both. 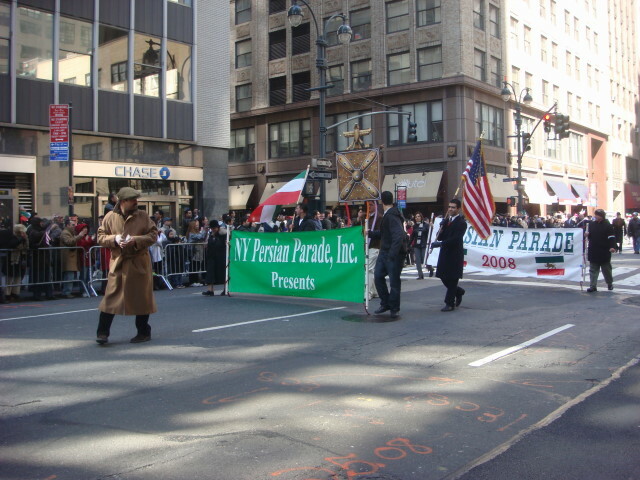 I don’t know what 1387 is, but I suspect that’s the Moslem year; which tends to contradict the Persian-centric angle of the parade. 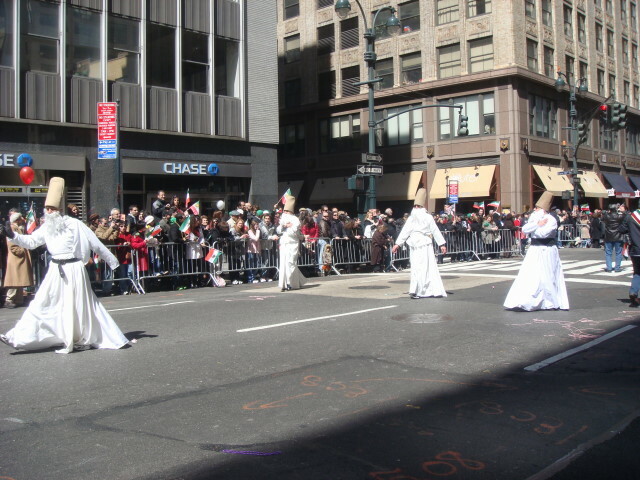 In neither this nor last year’s parades was there a strictly Muslim celebration. 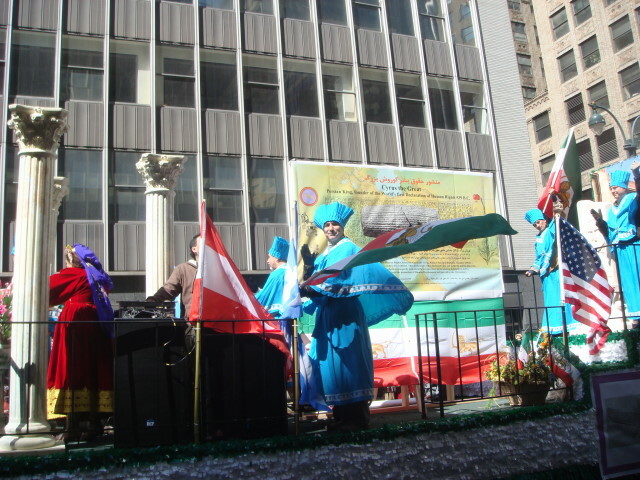 Instead, it was mostly Zoroastrian. Oh, and music. Lots and lots of music. And something very confusing. This was very unexpected. 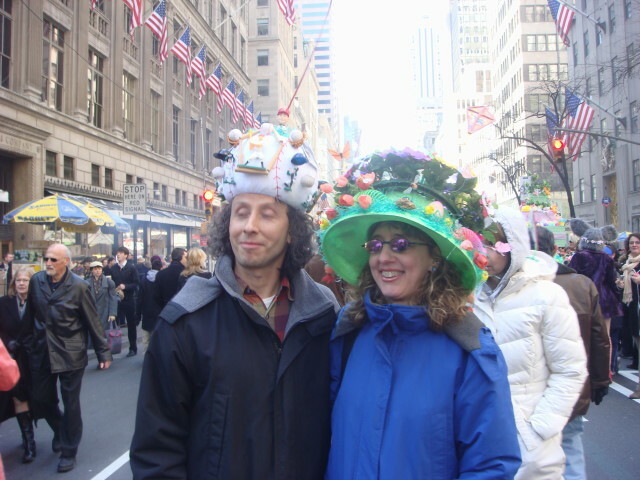 Take a look at these two characters and try to figure them out. It took two pictures, but they were together (both dancing, of course). To my eye, they look like Santa and “Black Pete”. 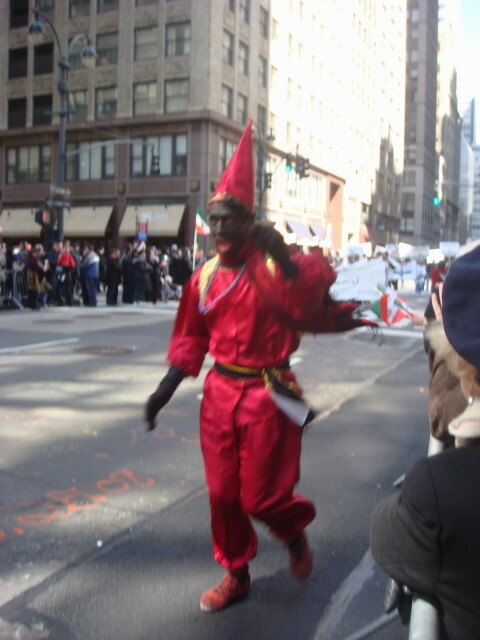 Black Pete isn’t a well-known American character, but is a Dutch traditional Christmas character from the 1800s or so. It makes no sense. 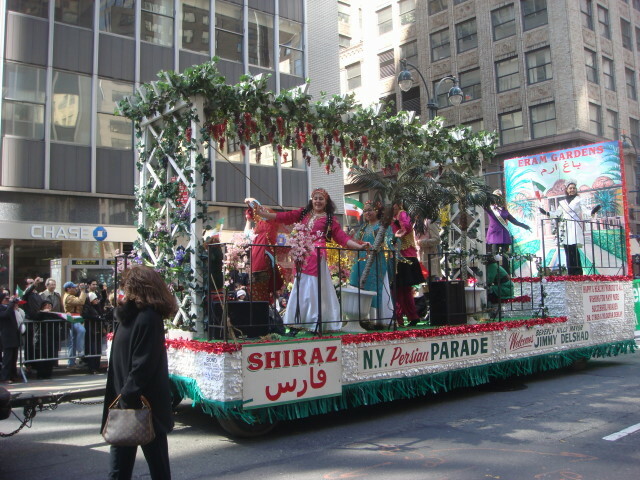 The only thing that is counter to it is that there is a character called “Rumi” who shows up quite a bit in the parade who looks very much like the Santa character. But there’s no secondary character with any of them. 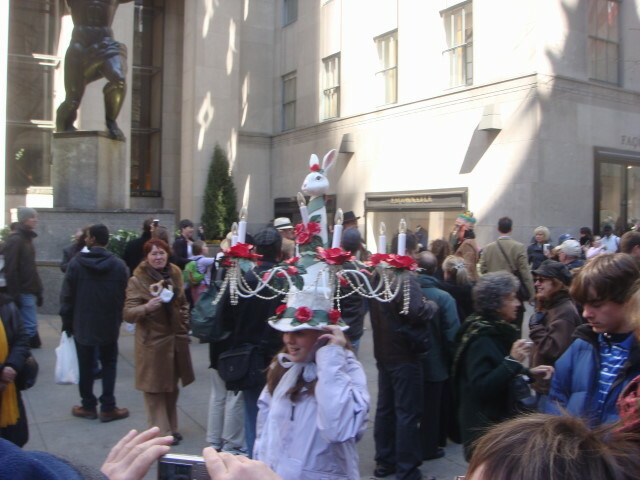 (In fact, there were often a bunch of Rumis at a time). 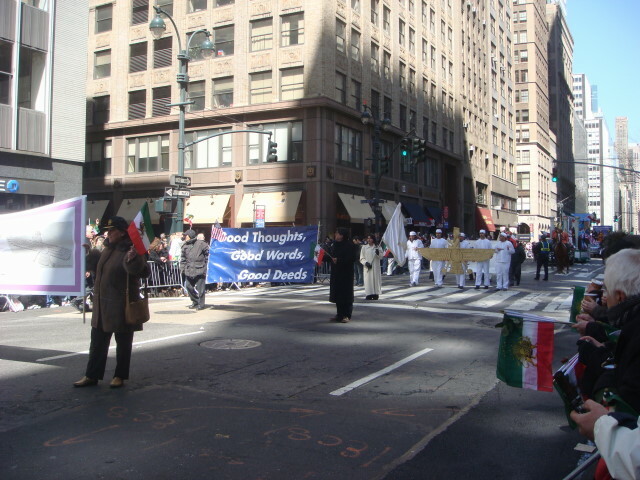 And then the Zoroastrians came with their slogan “Good thoughts, good words, and good deeds”. And then the dancing started. 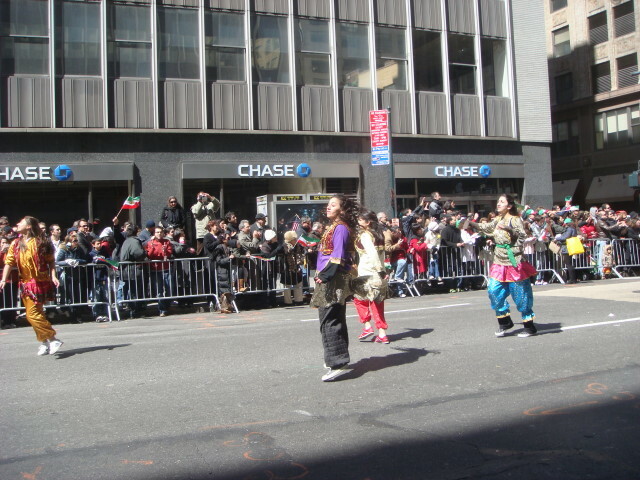 Okay, it seemed to be entirely separate from the Zoroastrians, but the dancers were the next to show up. 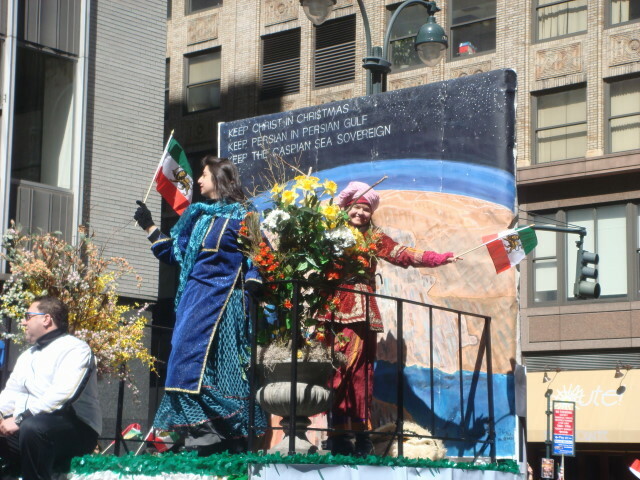 The music was from the float behind them. 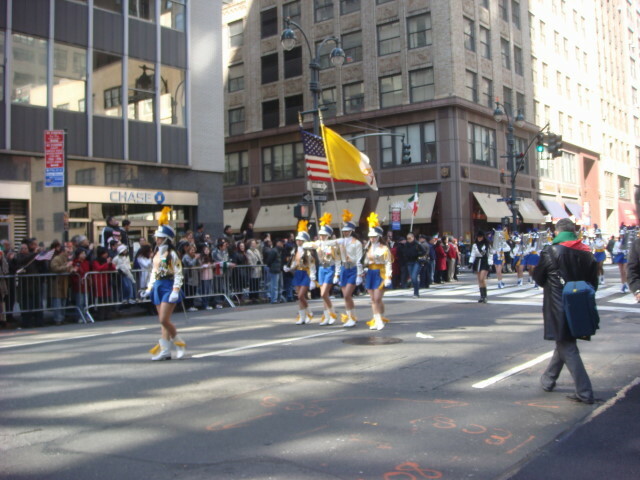 And then an old standby showed up: the Mother Cabrini marching band. 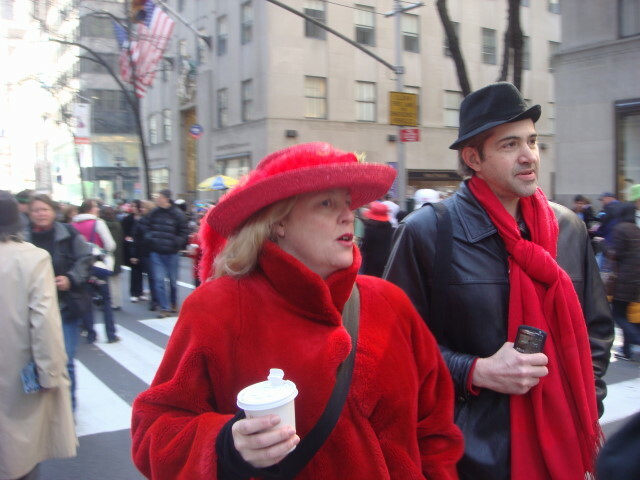 These folks are in almost every parade in NYC. 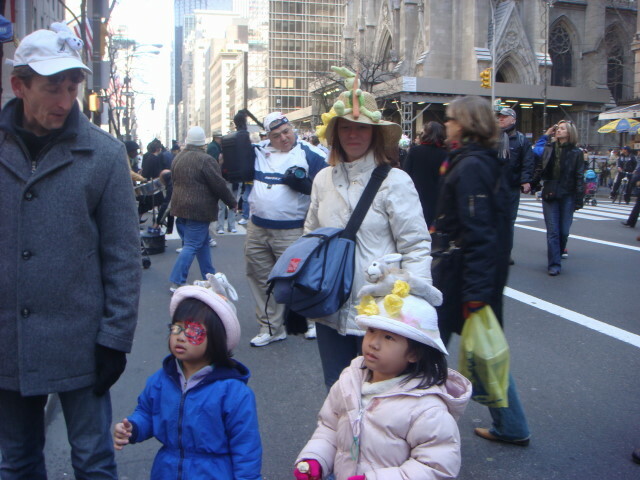 And then perhaps the strangest group in the parade. I call them “the exercisers”. 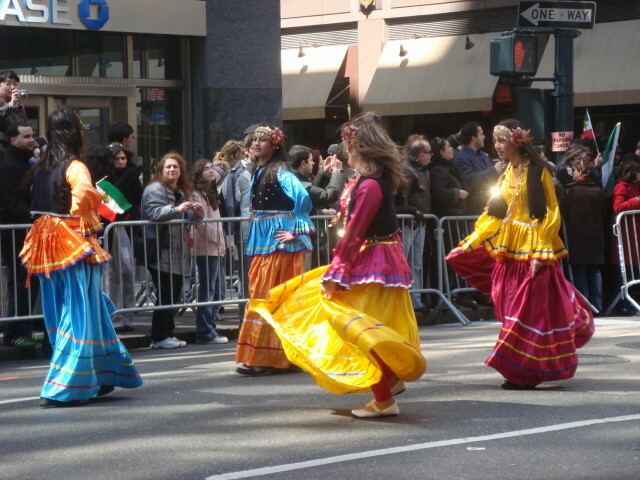 Oh, and they dance, too. Here are a couple of photos. As soon as they got past me, they went into pushups. 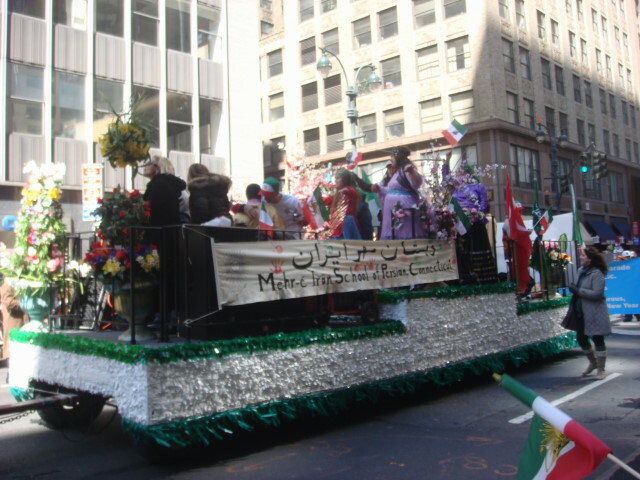 A float dedicated to the “Mofid Family” and their contrbution to Persian art and literature followed. 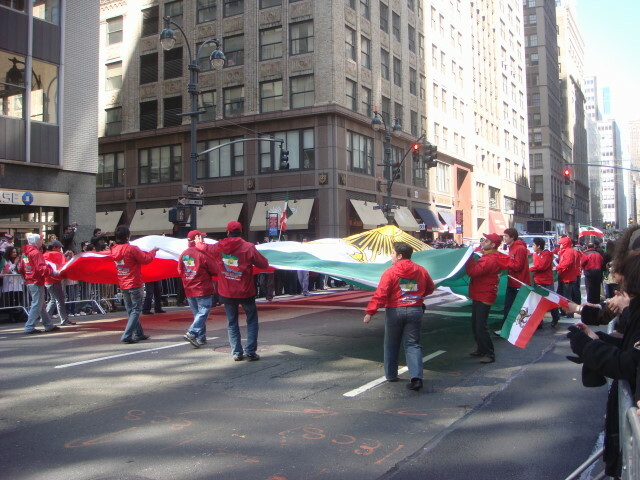 And then a bunch of flag wavers. 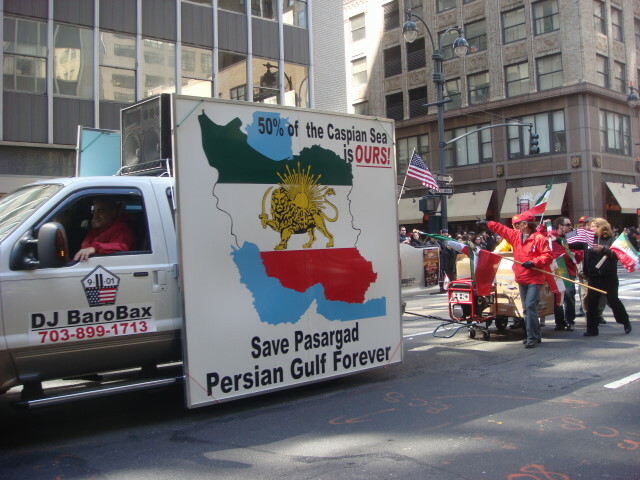 Well, Pasargad is an old Persian city, the Persian Gulf and the Caspian Sea are not connected (the Caspian is landlocked). So, there are three issues raised and, other than proximity to Iran, I don’t know the connection. The crowd this year was easily twice last year’s crowd and probably four times. 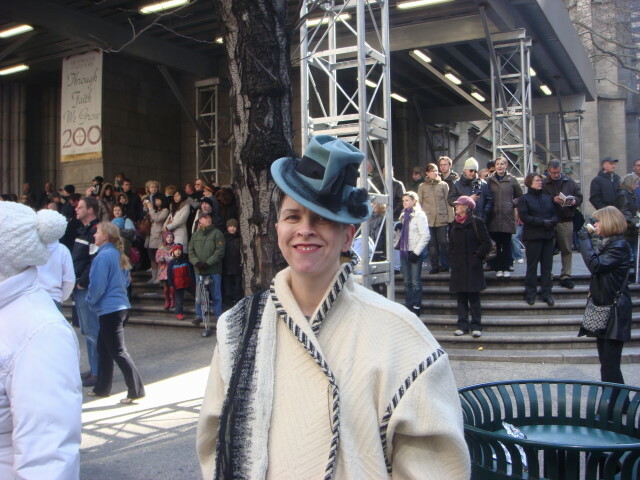 Last year, I stood for quite a while without anyone within ten feet of me. This year, it was jammed. 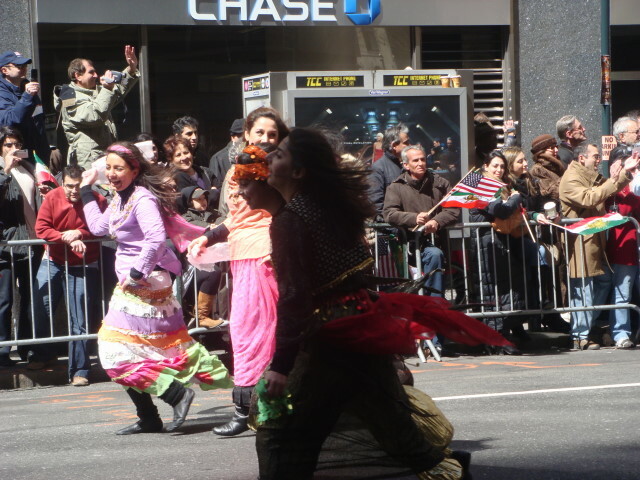 Next was the Aashtash Dance group from George Washington University. 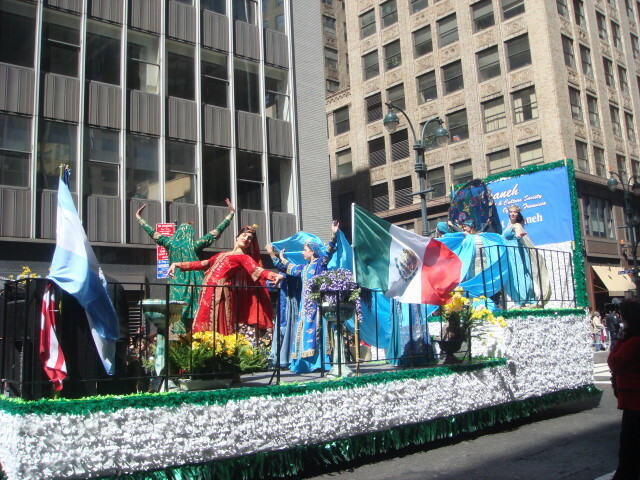 And then another float with even more dancers. 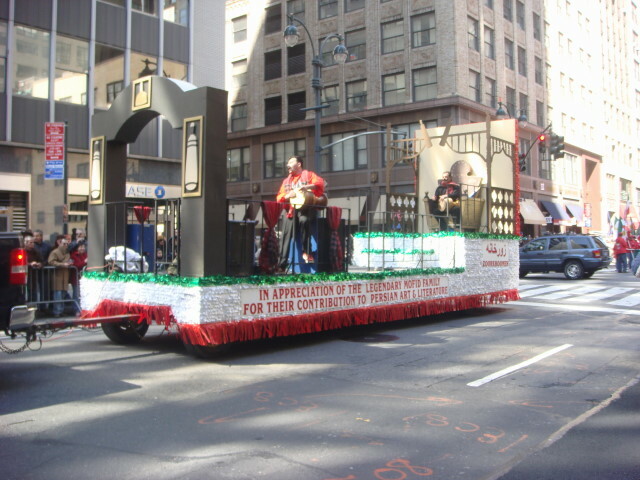 Which was followed by a float with two dedications. First, to “Yazd: Pearl of the Desert” which is a very ancient Zoroastrian city in the middle of Iran. And second, to the memory of Hassan Morshed. 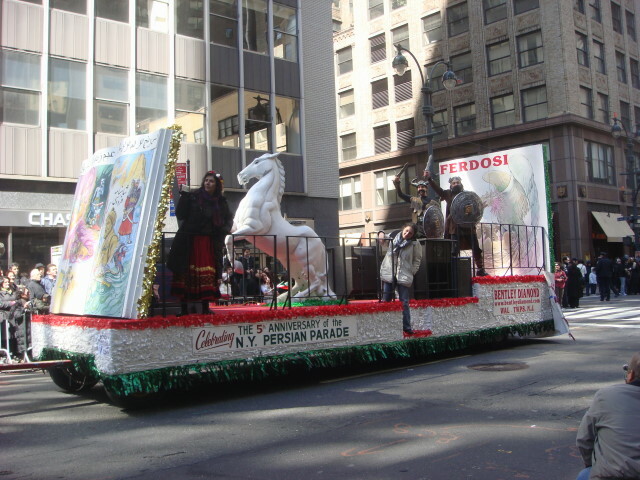 There was a woman somberly sitting on the float. I presume a family member, perhaps his widow? 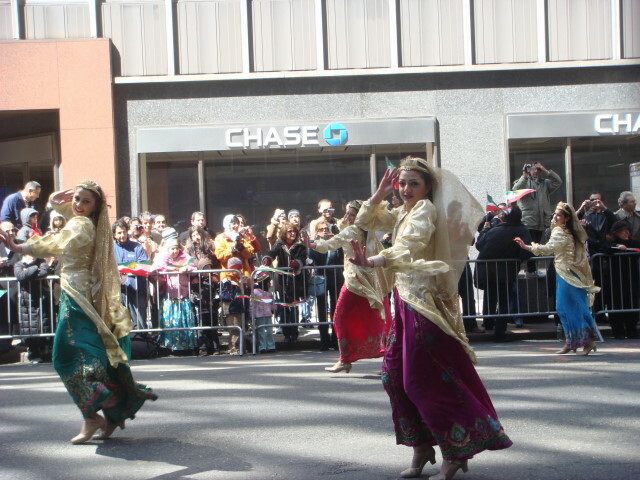 ….which was followed by more dancing girls. 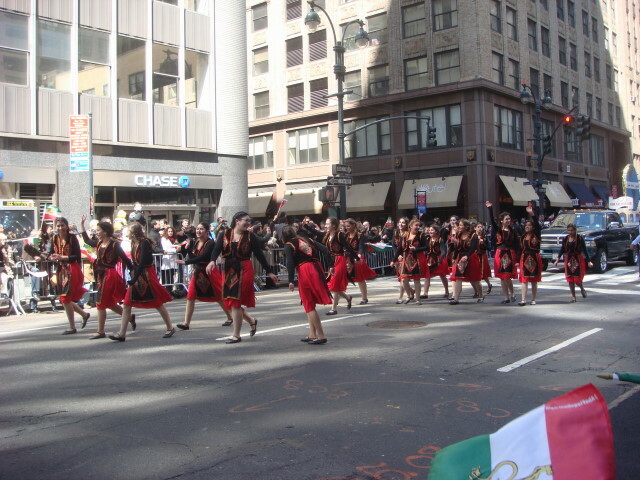 And then another cycle of float and girls. 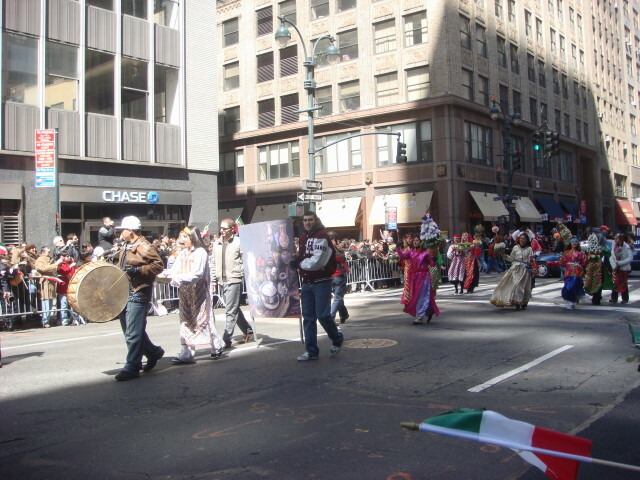 First, the Ferdosi who reminded me of Vikings but even the Vikings didn’t get that far (at least as far as I know). 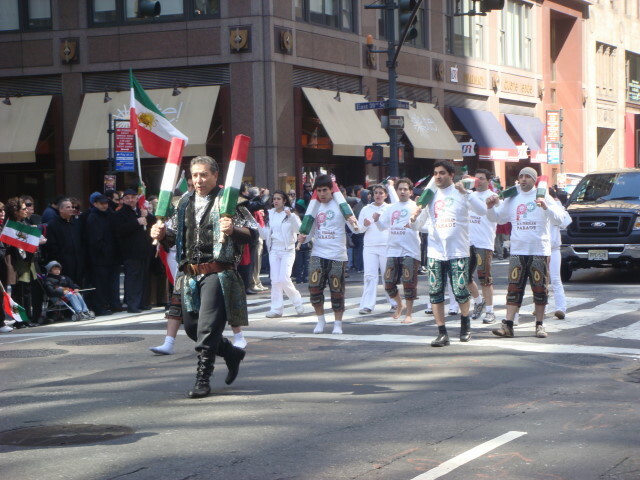 The only Ferdosi I could find was a Persian poet, so I don’t know if they are related. 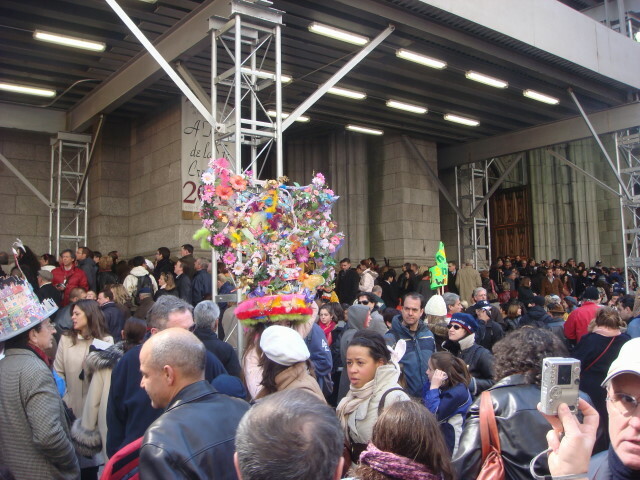 And that cycle of float and dancers was followed by…another cycle! This is now an officially huge and long post. To be continued tomorrow. You’ll never guess what followed the group above. Okay, more of the same! 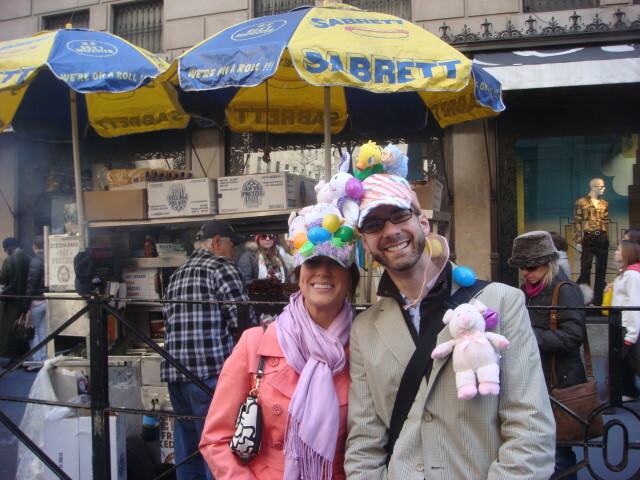 St. Mark’s Place (aka, 8th Street between 3rd Avenue and Avenue A) has some of the most interesting places in the Lower East Side. I really enjoy it down there. 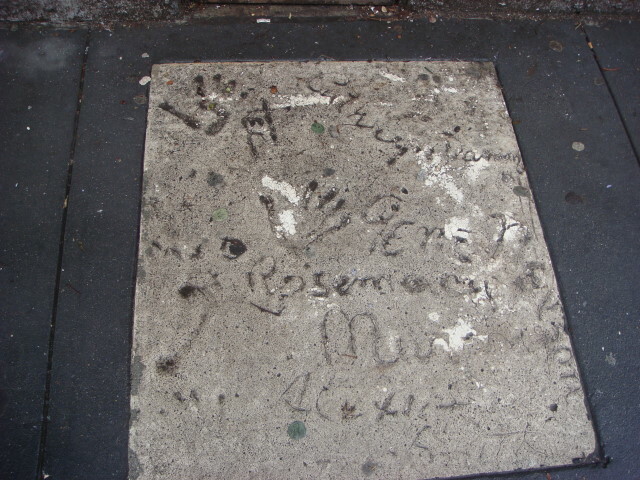 Recently, I was walking past a place I’ve seen a number of times, Pearl Theatre, and looked down and saw that they’ve got a sort of Mann’s Chinese Theater handprints and footprints thing going on. 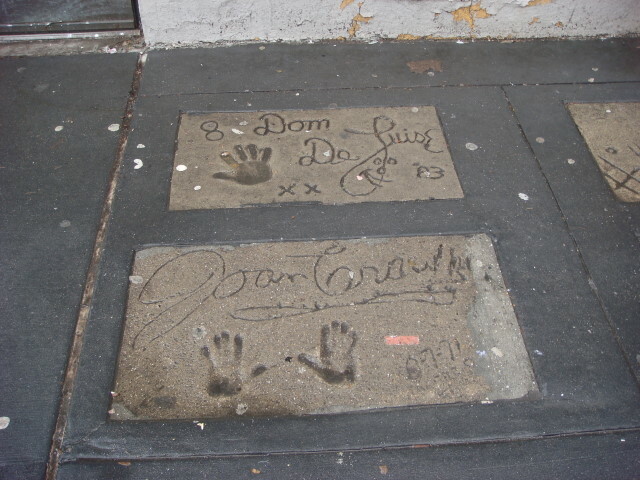 Below are Dom DeLuise and Joan Crawford. Now, that’s a strange twosome. Next are Hildegard(?) 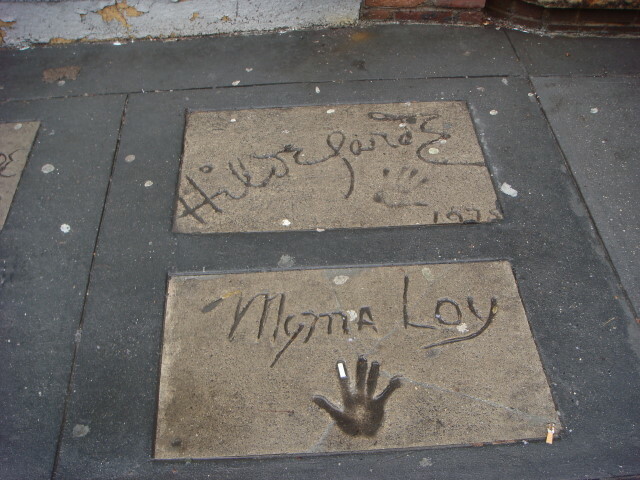 and Myrna Loy. 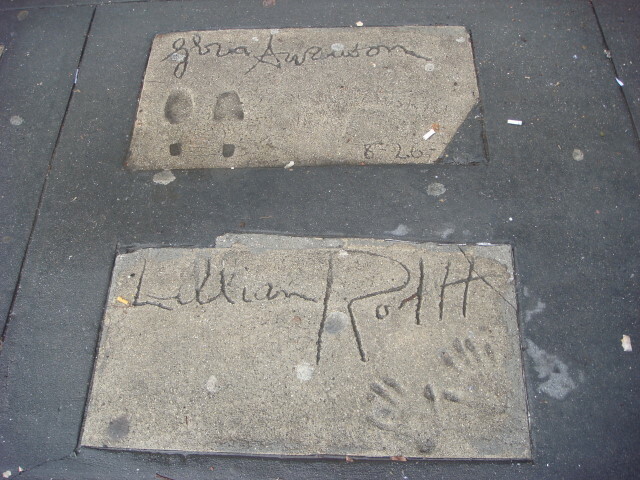 Next are Gloria Swanson and Lillian Roth. 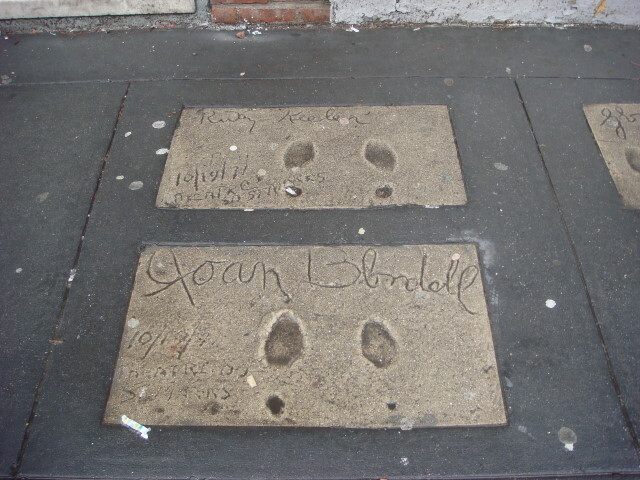 The next hold the prints for Ruby Keeler and Joan Blondell. 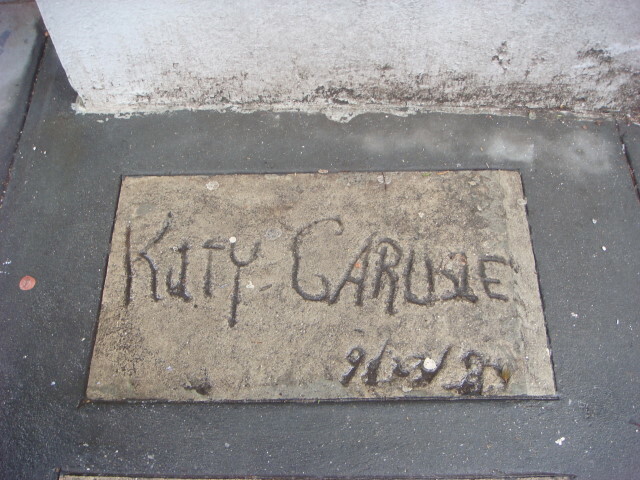 Next, Kitty Carlisle Hart (who recently died and was a NYC theater/opera/philanthropic legend). 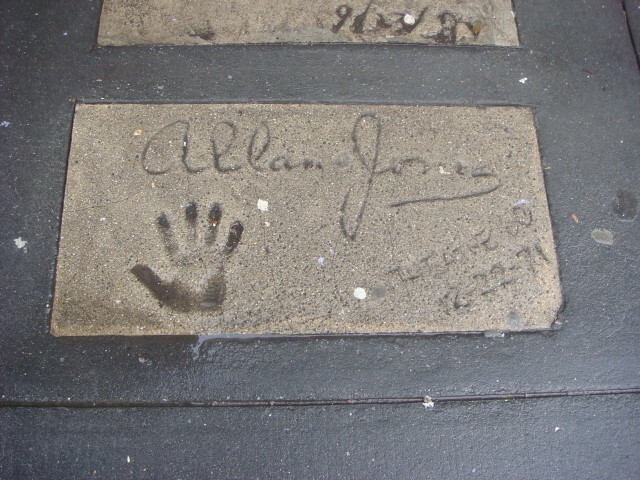 Next Allan Jones (an actor and the father of singer Jack Jones). I just can’t read the next one. 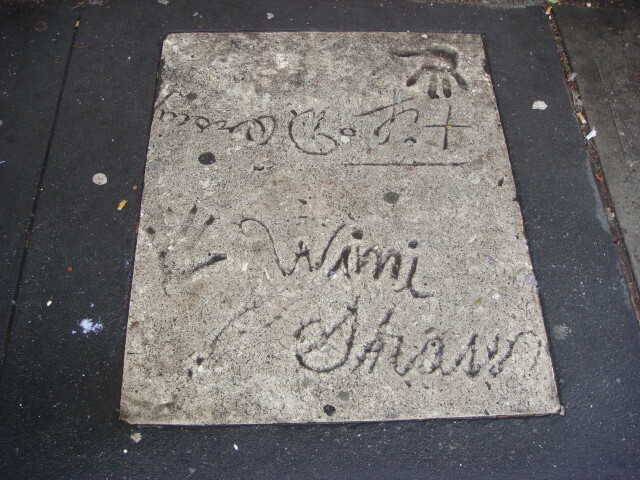 There are two names on the next, but the only one I can read, sort of, is “Wimi Shawn” or “Shaw” or “Shaun”. 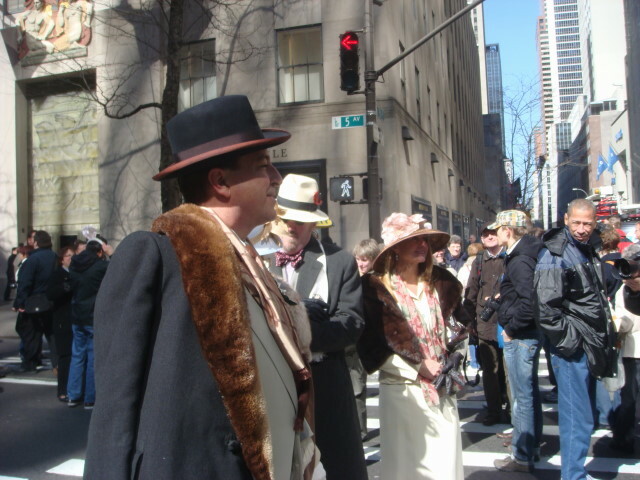 It almost certainly is not “William Shawn” as he was the famed editor of the New Yorker and it is hard to believe he’d put his handprints alongside people he may have covered. 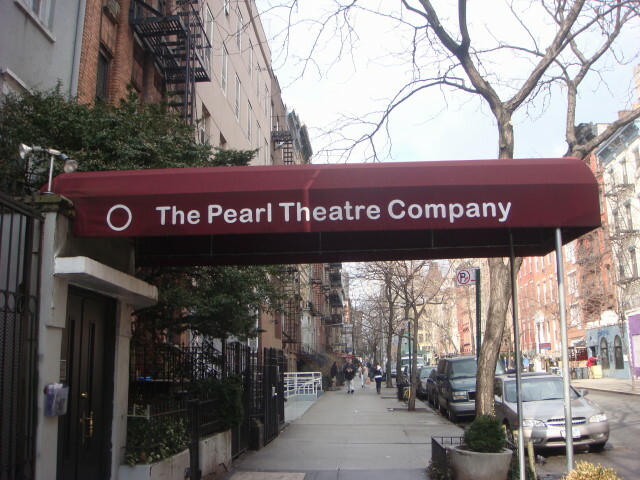 It could be “Wallace Shawn” (son of William Shawn) as he has some association with the Pearl Theatre, but it sure looks like there’s an “i” or two in the name. Under any circumstances, they haven’t taken great care with these names and prints. Too bad. There’s an old cartoon that shows how New Yorkers view the world, with Manhattan being about 90% of the map of the US. Like everyone else, I always found it humorous and a bit arrogant. 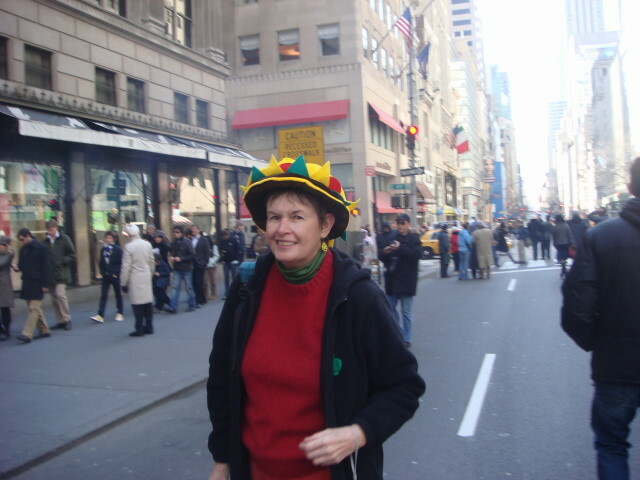 Well, that’s before I discovered that Greenwich Village encompasses the Whole World! It’s now a documented fact. 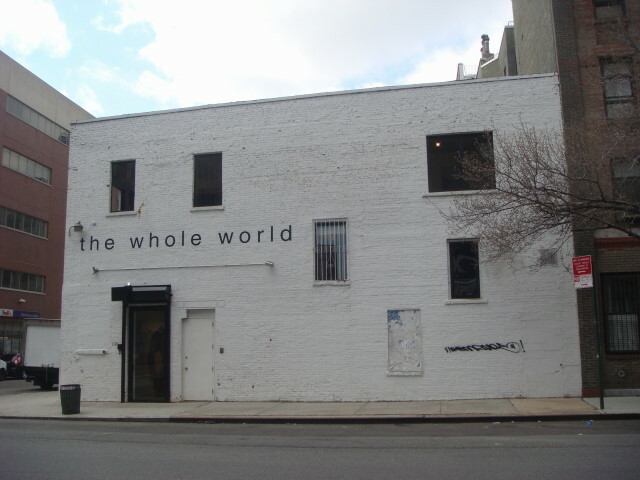 In case you want to know the exact location of the Whole World; it’s at Leroy Street and Greenwich Street (northwest corner). It seems a bit limited though. I thought the whole world was bigger and a maybe a different color, or at least a better paint job. 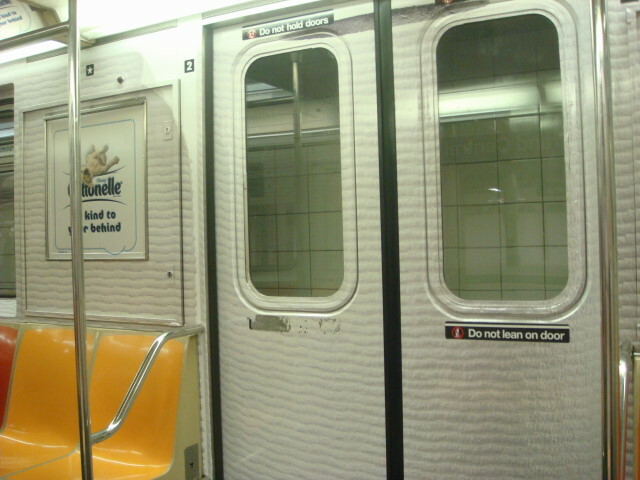 The Shuttle is a subway that goes between Grand Central and Times Square. It’s one of only a very small number of east-west subways in Manhattan. It just has those two stops. On a recent day, I was using the shuttle in my quest to get to Greenwich Village and noticed that they are up to their usual “tricks”. As I walked in the Shuttle Passage to get to the Grand Central stop, I started seeing a toilet paper motiff. 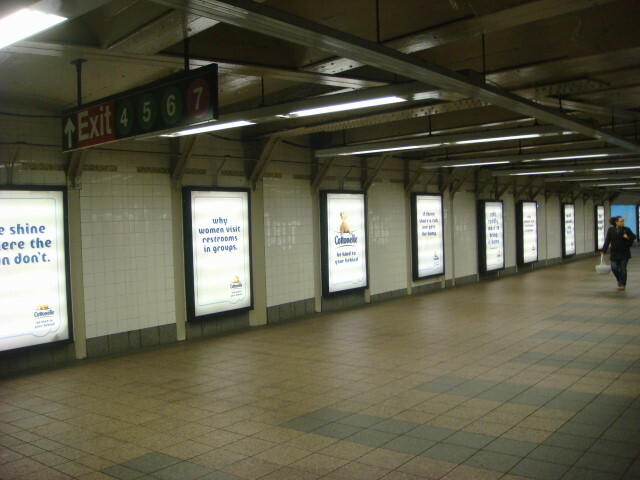 Every few weeks, a company will buy up all of the advertising spots in the passage. 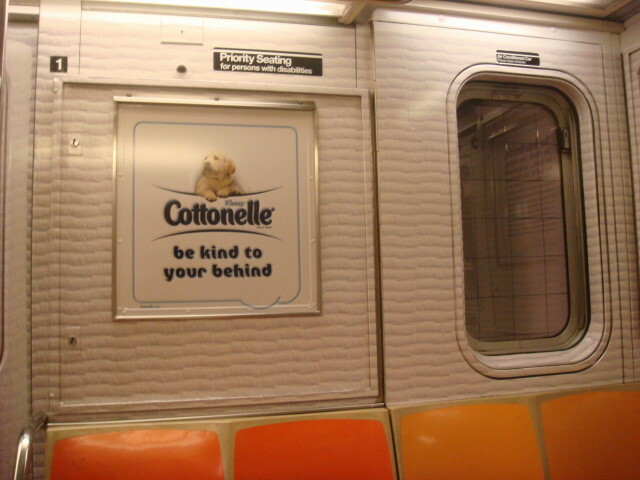 This time, it was Cottonelle. No big deal. Like everyone else, I see their ads on TV and all. Nothing special here. But what was a bit different is that they went the whole nine yards and also paid for the remodeling of one of the subway tracks. You see, there are three separate tracks on the subway and Track 1 has the distinction of using their cars as advertising media. Not in the sense of the outside, but of the inside. And we aren’t talking just signs in there (although they do that, too). We’re talking about the entire walls and doors of the subway. The walls have been painted/silkscreened to look like a closeup of toilet paper. Now that’s odd. It goes all the way down the car’s inside. The signs themselves take the position of doing sort of an inspirational/humorous view of toilet paper and its uses in modern life. It’s cute, but ultimately quite juvenile. And, although I said they went the whole nine yards, they really didn’t. Sometimes the companies that do this will redecorate the seats, too. 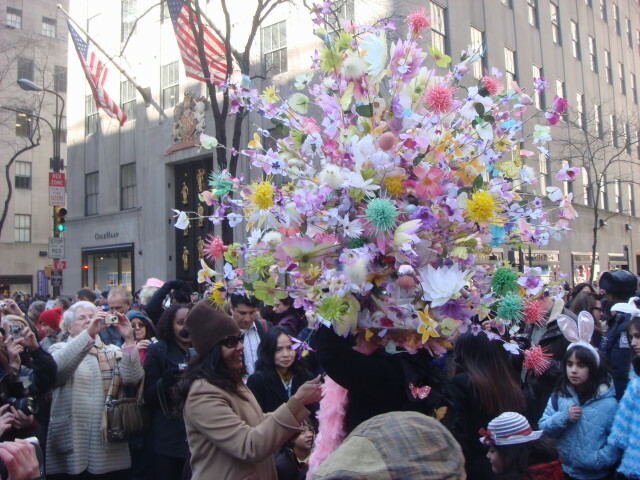 But that might get a little too weird, even for NYC. 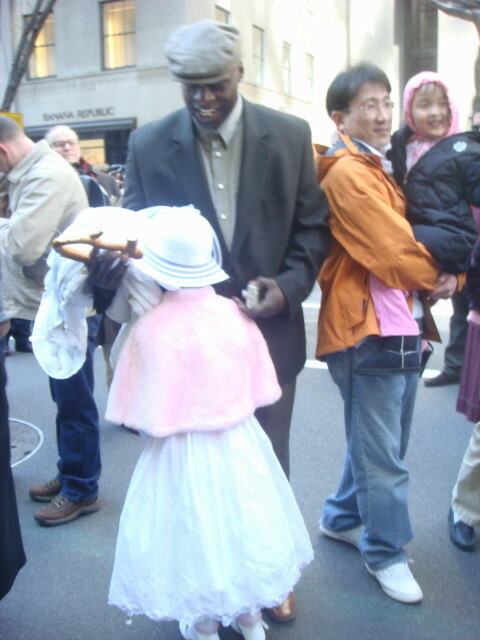 This is the last of my posts on the 2008 Easter Parade. I ended my last one saying that there was a certain regularity to the process: spot, approach, and take a picture. True enough, but it’s a light-hearted affair and everyone seems to enjoy it. 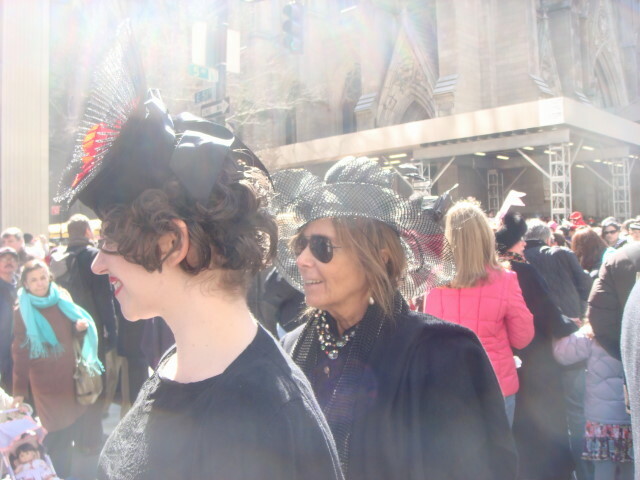 The young ladies above were delightful. 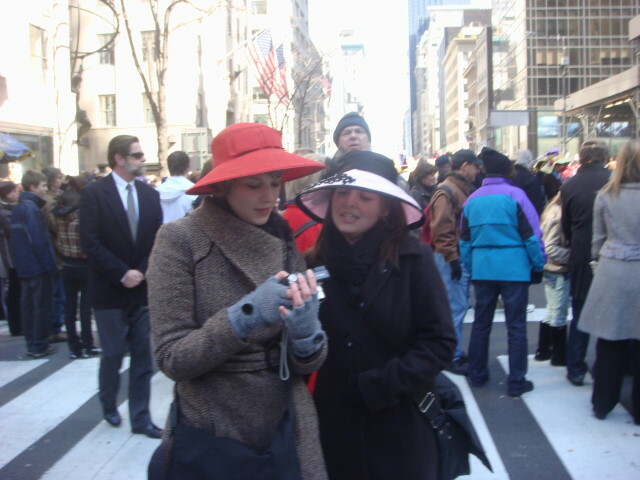 I had taken a couple of snaps when the one on the left spotted me, wheeled her friends into position and I got the picture. Thank you. 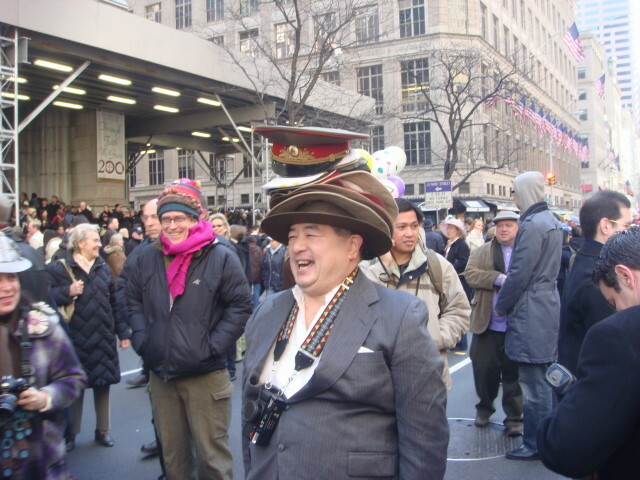 Up until this year, I had never seen a man with a hat who either wasn’t escorted by one or more women, or who wasn’t a street performer. This year, they were all over the place. 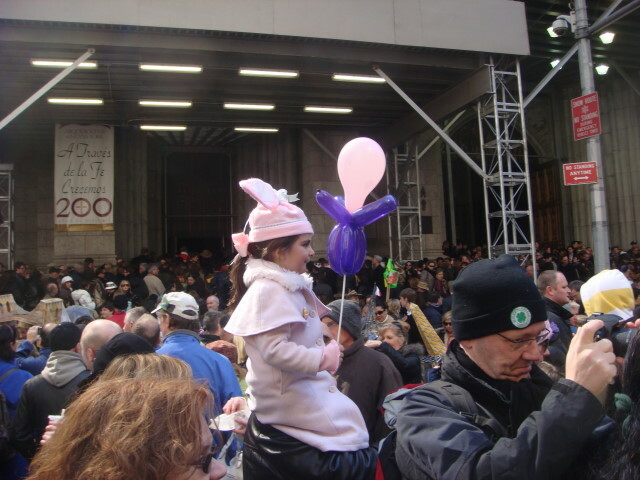 The little girl below was watching an orange-fox street performer and was trying to explain to her parents what it was. 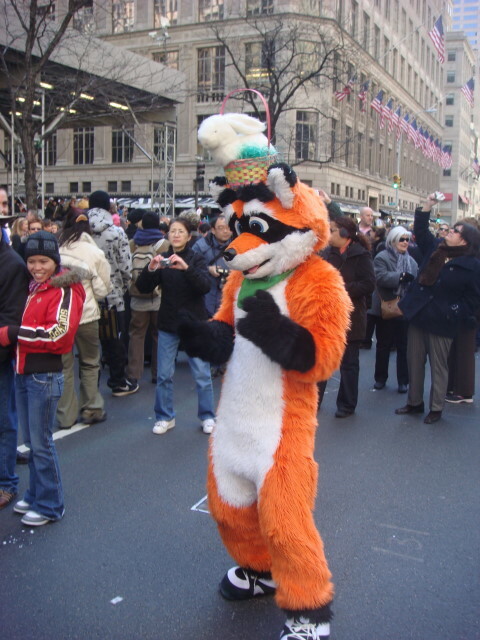 There were a few people taking pictures of the fox, and a whole bunch taking pictures of the girl. Okay, okay. I got ’em both. 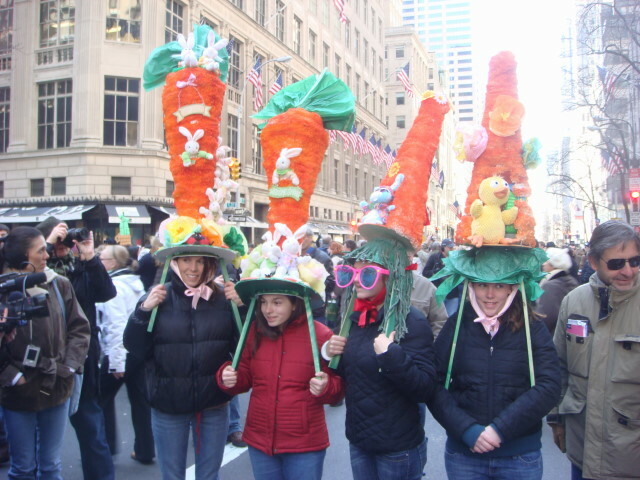 This group of carrots were pretty popular. 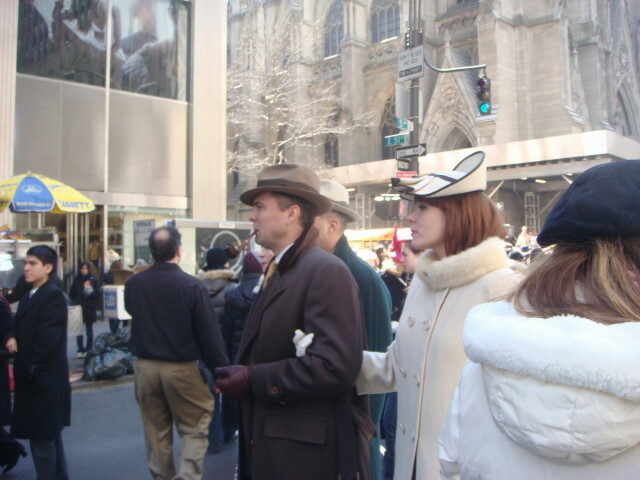 They parked themselves outside of St. Patrick’s and just kind of wheeled around getting their picture taken constantly. 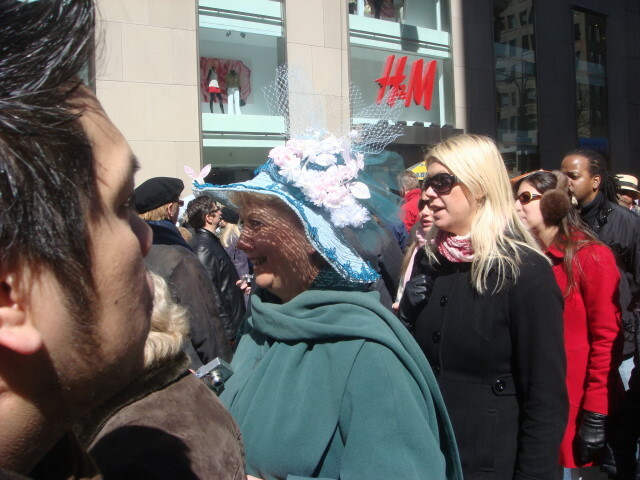 The below woman had the widest hat around. She’s being interviewed, I think by TV-1. Yes, a bikini-wearing grandmotherly type. 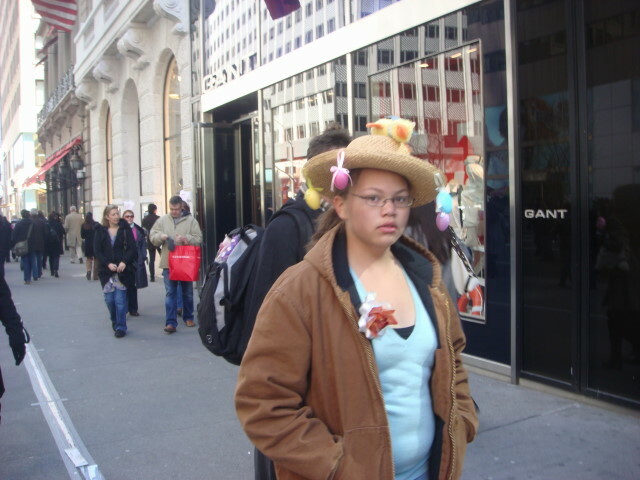 It’s New York. I couldn’t figure out the guy below. 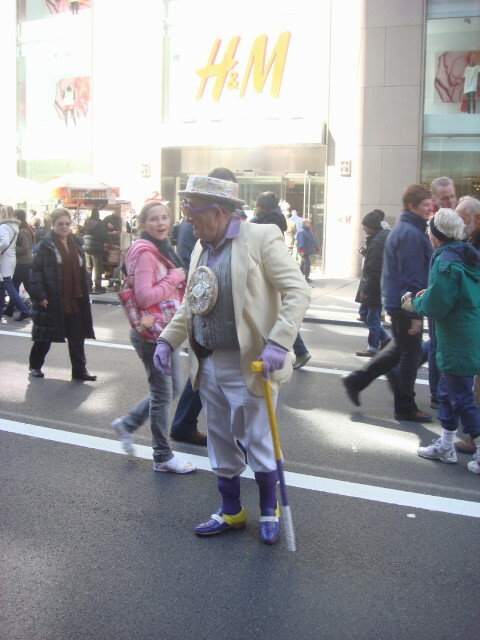 He was posing with a lot of people and his outfit looks almost like he’s a street performer; but he’s probably just another New Yorker wanting attention. 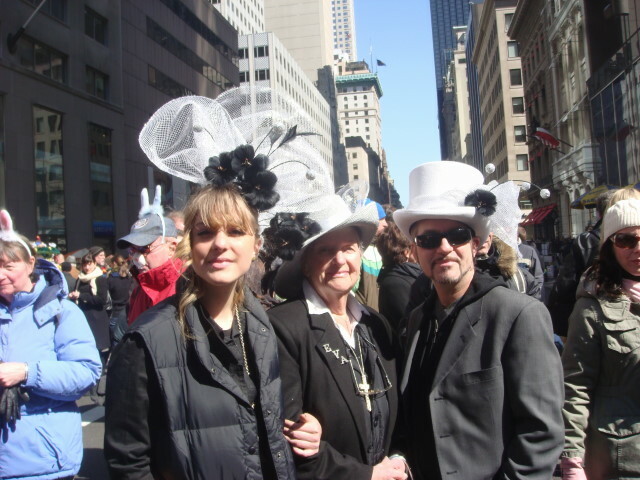 More of the formal hats. The below young girl never seems to have raised her head after discovering that there were just a few hundred of us wanting her to pose for a picture. The poor kid couldn’t handle the attention. Dad had a great time, though. 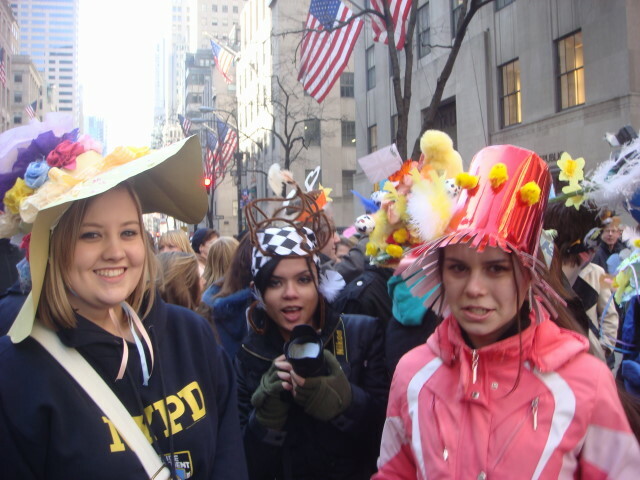 The two on the right were in some sort of rat costume. 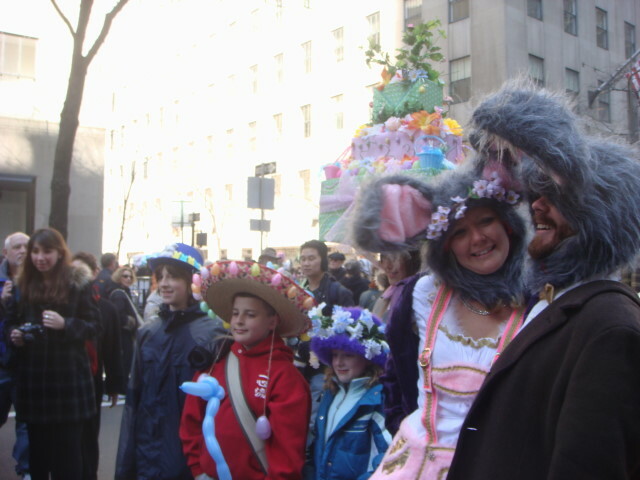 I don’t know if they got the memo: the parade’s about bonnets, not rodents. And my final picture of the day. 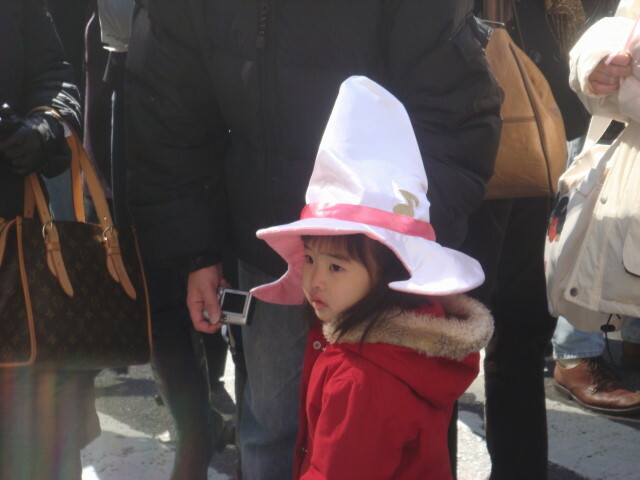 Last year and the year before, I would see some huge, huge hats. Some would actually be nothing less than small trees. 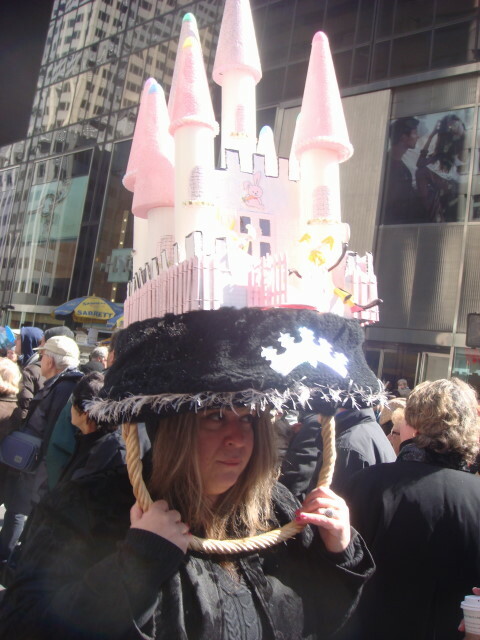 Another popular hat was one depicting a roller-coaster. I remember several variations on that. This year? No sign of ’em. It may have been just a touch too cold or too early for such. 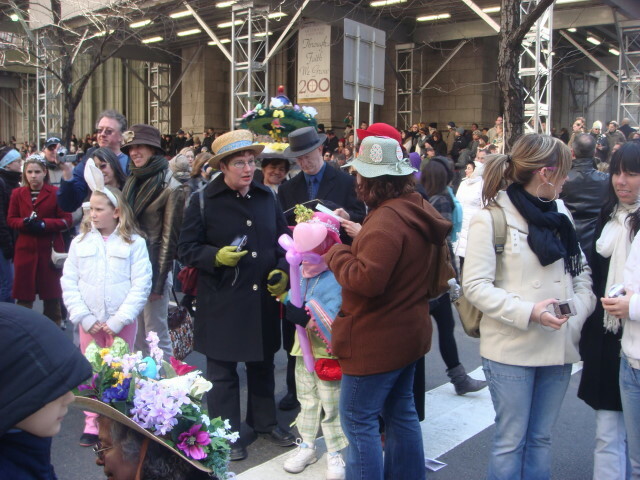 Or, maybe, the larger crowds are just pushing them away or something. 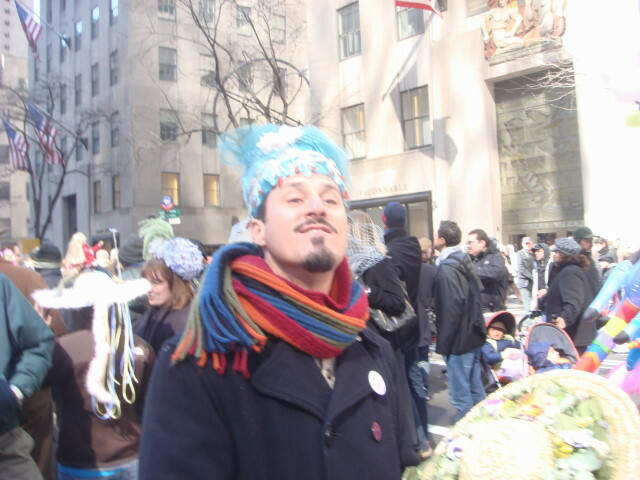 In any event, I did enjoy the parade and still don’t plan to wear a hat next year. 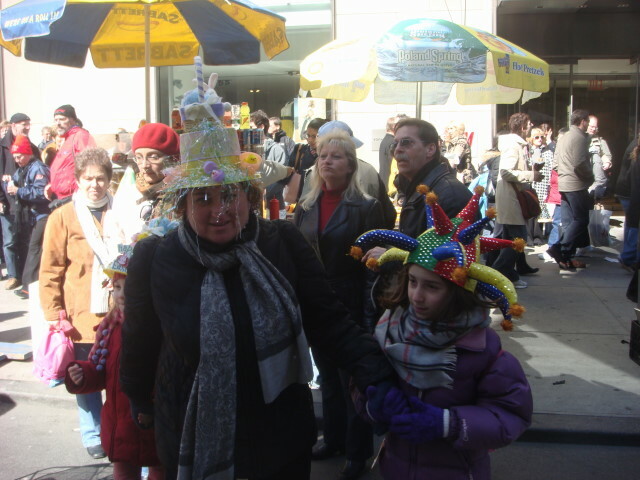 More pictures from my 2008 Easter Parade wanderings on Fifth Avenue in Manhattan. 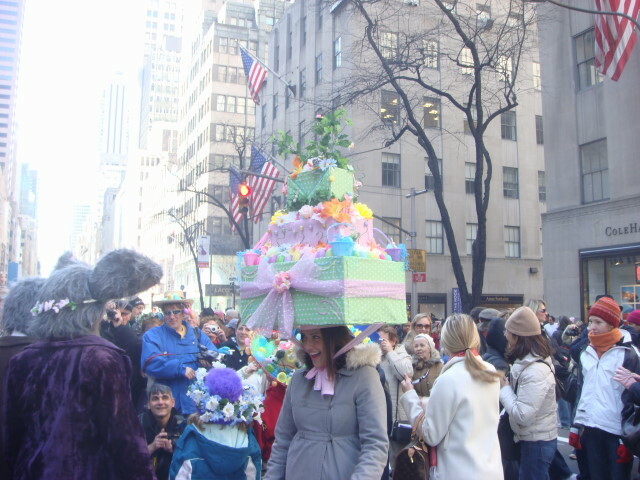 The above was one of the few “grand but weird” hats. They just didn’t seem to be as numerous as usual. Maybe I left too early for others, but I don’t think so. The picture below captures some of all types. 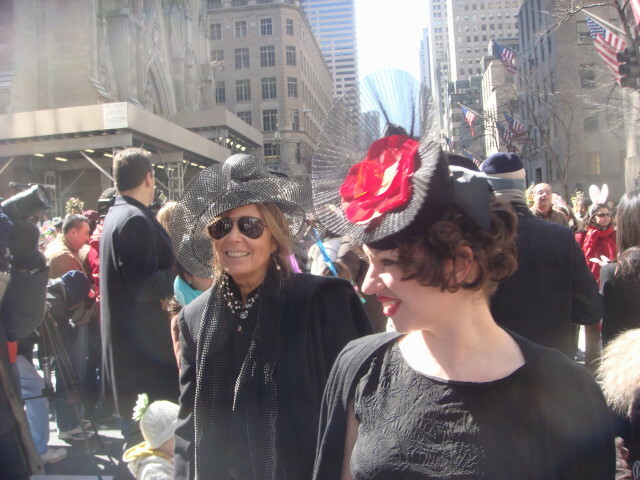 Some of the more formal hat-wearings that I enjoyed. 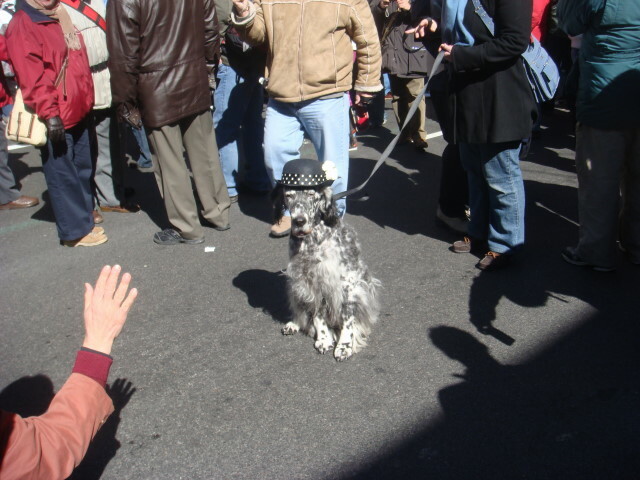 And, yes, there were dogs. 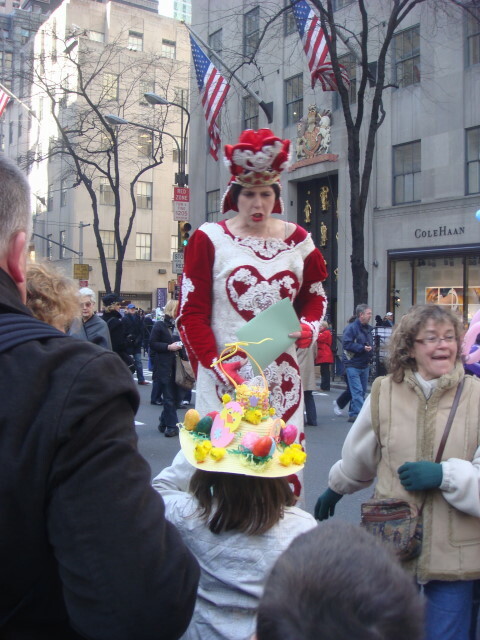 Perhaps the most unique person in the parade was the Queen of Hearts. Oh, yeah; she’s on stilts. 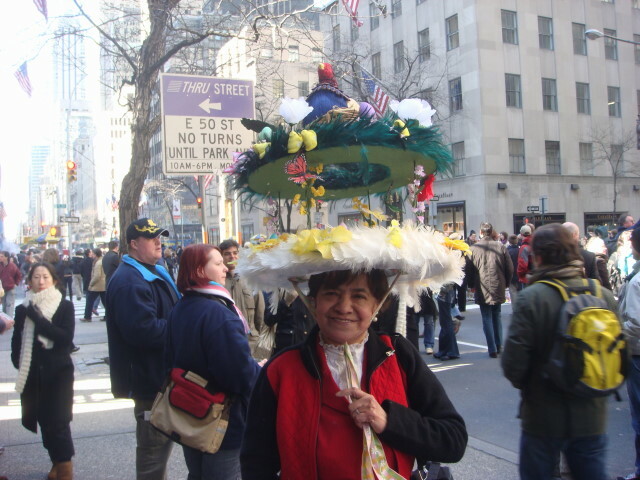 She just towered above everything. 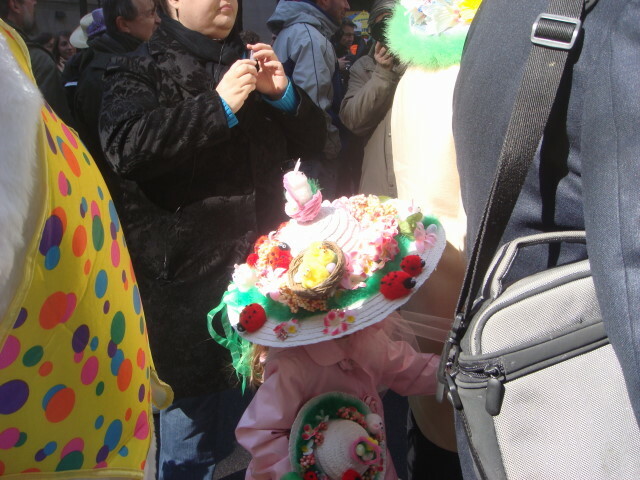 Take a couple of kids and put hats completely over their bodies, tack on some fake small clothes much lower on their bodies and…. 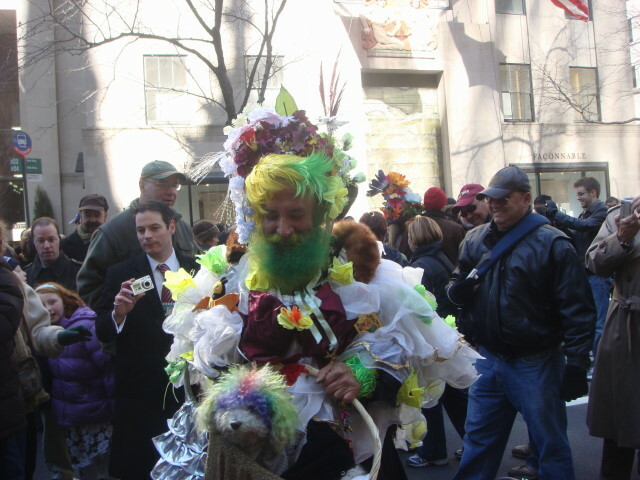 The guy below is at all of these events, along with his dog. 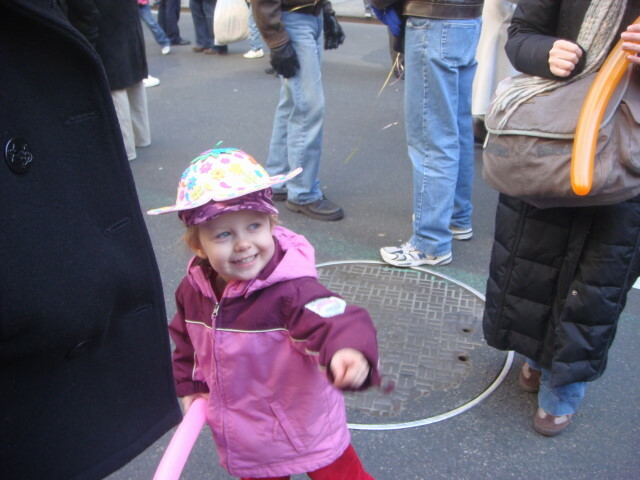 But the little girls are still the better subjects. Some more formal wearing-types. Quite a bit exaggerated, but that’s fine. Another shot of the crowd. 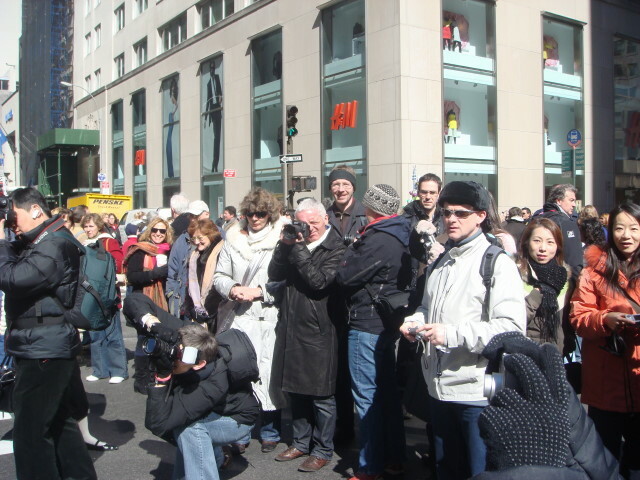 This was the group taking photos of the people above. Some were utterly shameless in trying to grab attention. 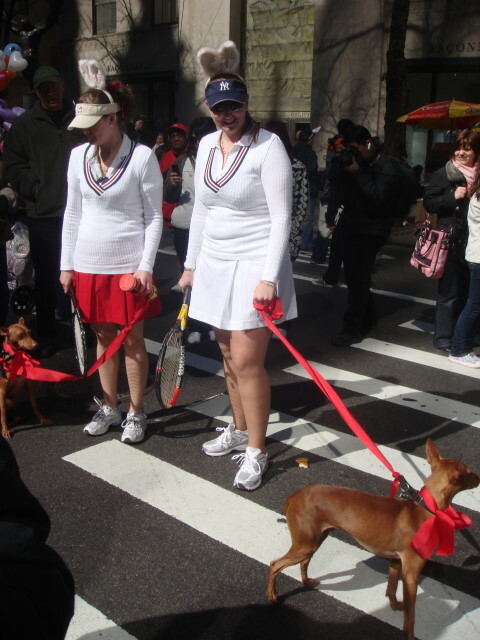 Tennis tog wearing women with dogs…and then the women started to play a sort of badmitten game with each other. 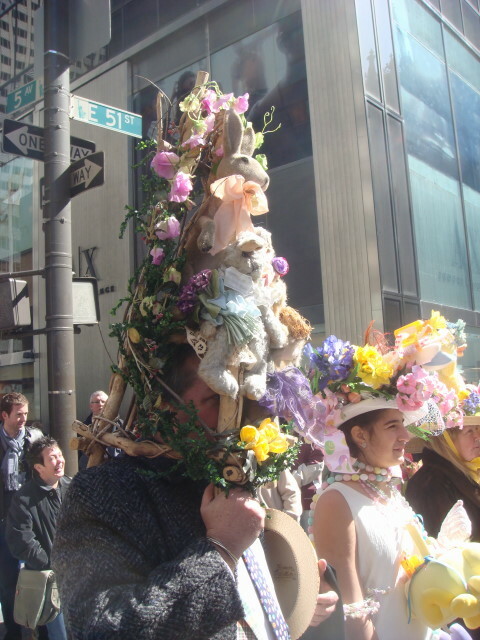 It’s a man under all that hatness below. I’m guessing he agreed to wear a hat if it obscured enough of his features that would prevent his ever being recognized. Well done, sir! 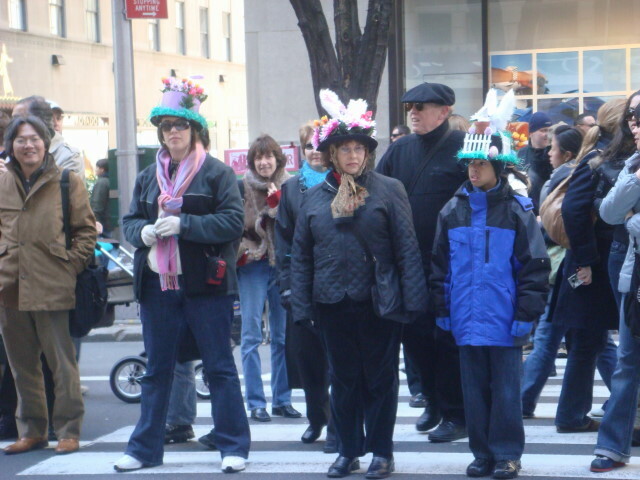 More of the more-formal-type-hats. Not truly formal, but more than normal over the past few years. Tomorrow, I’ll finish the posts. 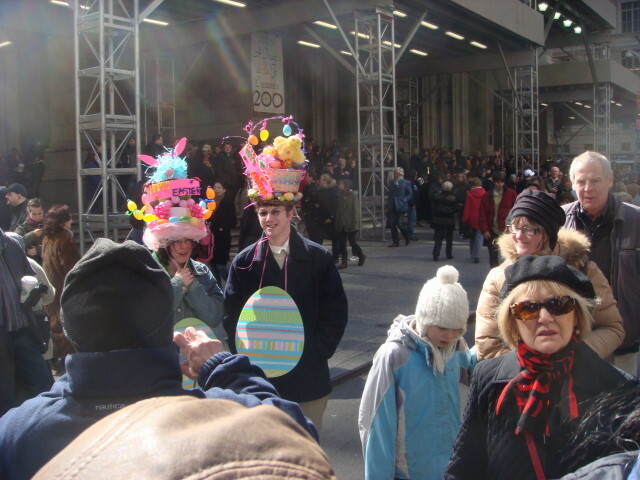 There’s really not much to say: you mill around and spot someone in the distance with a hat. You work your way over there and find a few hundred others are doing the same thing. 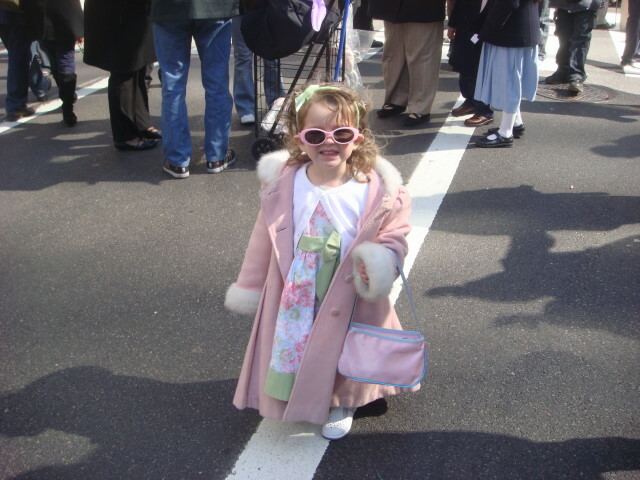 You are currently browsing the Famous Ankles weblog archives for March 2008.